The Future Buddha was once born as the son of a rich man and was known as “Sumedha” in the very existence in which he was to make a solemn wish that he should become the Enlightened Buddha. His parents died while he was still young, leaving him many treasure vaults of gold and silver. When he was sixteen years of age and had finished his education, the Lord of the Treasury made over to him all the property left by his parents. Sumedha the young millionaire thought to himself thus: “My parents and grand-parents knew only how to amass wealth but did not know to take it away beyond death. I shall now give away my property in alms so that the merit of the deeds may follow me after death.” He made a public announcement: “Whoever cares to take away my property may open my treasuries and help himself to his heart’s content.” He then left for the Himalaya forests and became a hermit. Hermit Sumedha, the Future Buddha, had attained the six High Powers. While traveling by air he saw the townsfolk of Ramma clearing the pathway and came down to the ground, and asked to be permitted to clear a portion of the track on which theÂ Buddha DipankaraÂ was to travel. He was given a portion of it, and before he had cleared it, the Buddha Dipankara came along that way with a retinue of arahants. 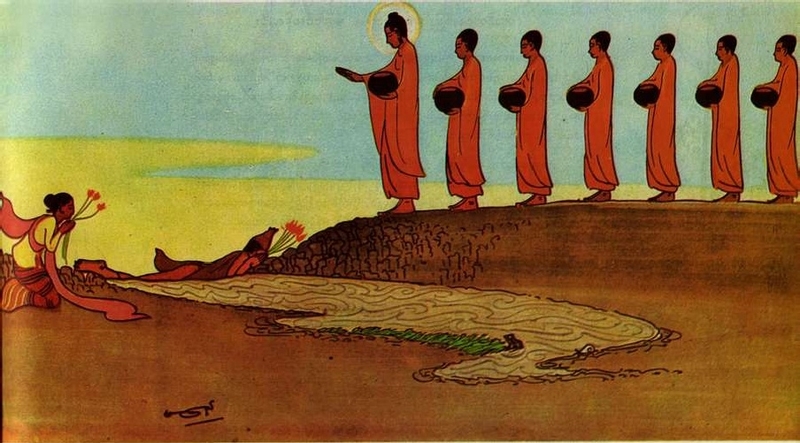 Sumedha spread himself out upon the mud with his face downwards, his body serving as a bridge so that the Buddha and the disciples following Him could tread on him. At that moment a lady by the name of “Sumitta” arrived with eight bunches of lotus flowers. She handed over to the hermit five of those bunches to be offered to the Buddha. The Buddha, with minds eye of Buddha, saw what was in store for these two persons in future, and made this prophetic declaration: “This hermit will becomeÂ Gotama Buddha, and this lady will become his help-mate to help him fulfill the Perfections (Paramitas)”. The Future Buddha fulfilled the Ten Perfections in his many existences over a period of four Incalculables (asankhyeyyas) and one hundred thousand worlds. In one life before the life when he became the Buddha, he was born as one of the chief gods and known as “Setaketu” in the celestial city of the Tusita gods. When the span of his life there as a god was fast approaching its end, the higher and lower gods of all ten thousand worlds came into one place inÂ Tusita heavenÂ and approached the Future Buddha saying, “Sir, it was not to enjoy the glory and sensual pleasures of a god or of man that you fulfilled the ten Perfections; but it was to become a fully enlightened Buddha in order to save the world, that you fulfilled them. Sir, the time and fit season for your Buddhaship has now arrived. Be so good as to depart from the world of gods and take conception in the womb of a human mother in the world of men”. The Great Being assented to their wish. The four guardian angels came and lifted her up, together with her couch, and took away to the Himalaya Mountains. There, in the Manosila table-land they laid her upon a huge slab of sulfurous rock under a very big sal tree. Then came the wives of these guardian angels, and conducted her to Anotatta Lake, and bathed her to remove every human stain. And after clothing her with divine garments they took her into a golden mansion which was inside a Silver Hill. There they laid her down upon a divine couch. Now the Future Buddha had become a superb white elephant and was wandering about at no great distance on the Golden Hill. Descending thence, he ascended the Silver Hill and went into the golden mansion. And splitting her on her right side, he entered her womb. Thus the conception took place. 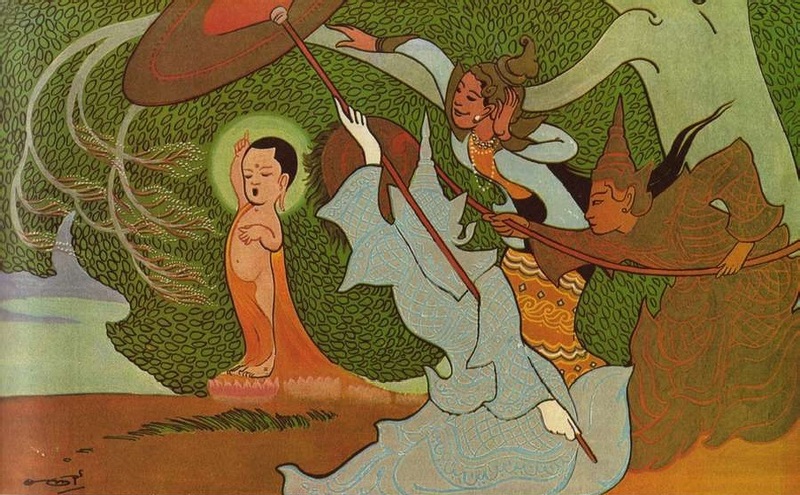 Queen Maha-Maya carried the Future Buddha in her womb for ten months; and on the full moon day in May (Vesak) she said toÂ King Suddhodanaâ€””I wish, O King, to go to Devadaha, the city of my family”. The King approved and caused the road from Kapilavatthu to Devadaha to be made smooth and adorned, and sent her with a great retinue. Between the two cities there was a pleasure grove of sal trees, calledÂ Lumbini Grove. She entered the grove for a rest. And at this particular time, this grove was one mass of flowers presenting a very pretty scene. She went to the foot of a great sal tree and reached out her hand to seize hold of one of its branches. She was at once shaken with the pains of birth. Thereupon the people hung a curtain about her, and her delivery took place while she was standing up. At that moment came four Mahabrahmas (higher gods) with a golden net; and, receiving the Future Buddha with it, they placed him before his mother and said, “Rejoice, O Queen! A mighty son has been born to thee”. 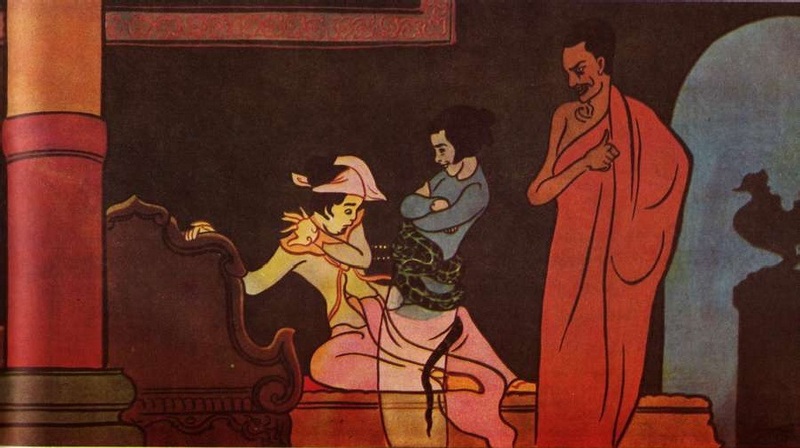 Â Â Â Â Â Â Â Â Â When the Future Buddha was sixteen years of age, his father King Suddhodana sent official intimation to his relatives asking them to send their daughters to be married to his son. There arose the following discussion among his relatives, who were Rulers of their own states:â€””Siddhattha is of handsome appearance but is not well trained in any manly art”. They did not, therefore, comply with the request of King Suddhodana. The King told his son what his relatives had said about him, when the Prince agreed to show his proficiency as the best bowman of the day. Consequently the most distinguished bowmen of the city were assembled in the palace grounds. The Future Buddha placed them at four different points and directions round him while he stood in the centre. He then said to them. “You must shoot your arrows at me all at the same time”. When the signal to shoot was given, the four archers shot their arrows at him all at once. The Prince defended himself by shooting an arrow which flew like lightning and hit all the four arrows coming in his direction. He thus exhibited his skill, such as none other bowmen could equal. His father’s relatives then sent their daughters, beautiful maidens, of whom the Prince choseÂ Princess YasodharaÂ whom he married by celebrating a grand wedding. 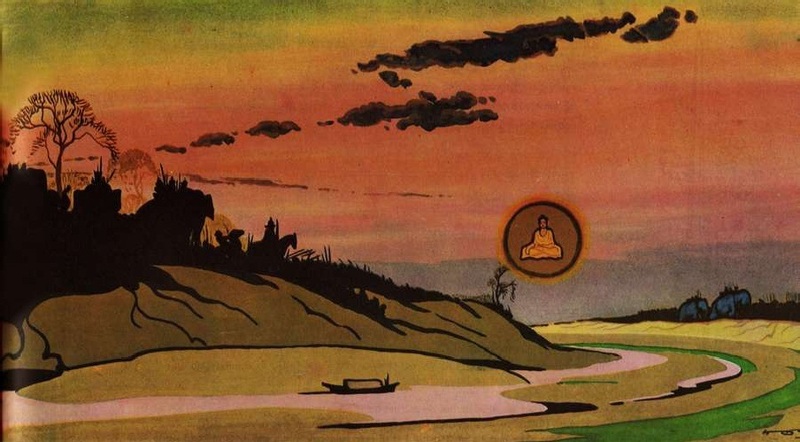 Â Â Â Â Â Â Â Â Â When the Future Buddha was 29 years of age he went to the park and saw theÂ Four Signs, namely, an old man, a sick man, a dead man and a monk, whom the higher gods had fashioned. He was afraid to continue to live a worldly life and his mind turned ardently to retiring from the world. He said to himself, “It behooves me to go forth on theÂ Great RenunciationÂ this very day”. At that very moment he received a message that a son had been born to him. Â Â Â Â Â Â Â Â Â He then returned to the palace and lying on his couch, fell into a brief slumber. When he awoke he saw the female musicians sleeping round him in disgusting condition. The spectacle seemed like a cemetery, and filled with loathing for his worldly life, he made up his mind to renounce the world at once. He ordered his courtierÂ ChannaÂ to saddle his horseÂ Kanthaka. He then walked to the chamber of Yasodhara to look at his son for the first time. Â Â Â Â Â Â Â Â Â The Future Buddha replied as follows: “Mara, I know that the Wheel Treasure was on the point of appearing to me ; but I do not wish for sovereignty. My sole desire is to become a Buddha and save the world of gods and men”. He then departed from the city in great splendor surrounded by higher and lower deities on all sides, the divinity that guarded the city-gate having opened it for them. Â Â Â Â Â Â Â Â Â The Future Buddha who left the city at midnight on his Great Renunciation came to the bank of theÂ Anoma (Illustrious) RiverÂ at day-break. 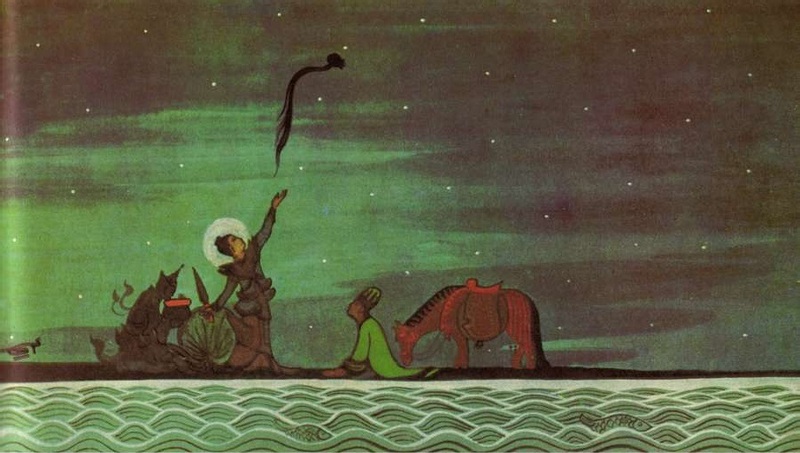 He gave the signal to his horse with his heel, and the horse sprang over the river, which had a breadth of eightÂ usabhasÂ (anÂ usabhaÂ is 140 cubits or 210 feet), and landed on the opposite bank. He handed over to Channa his ornaments and the horse, Kanthaka, and asked him to go back home with them. He then cut his hair with the sword on the sandy beach of the Anoma. 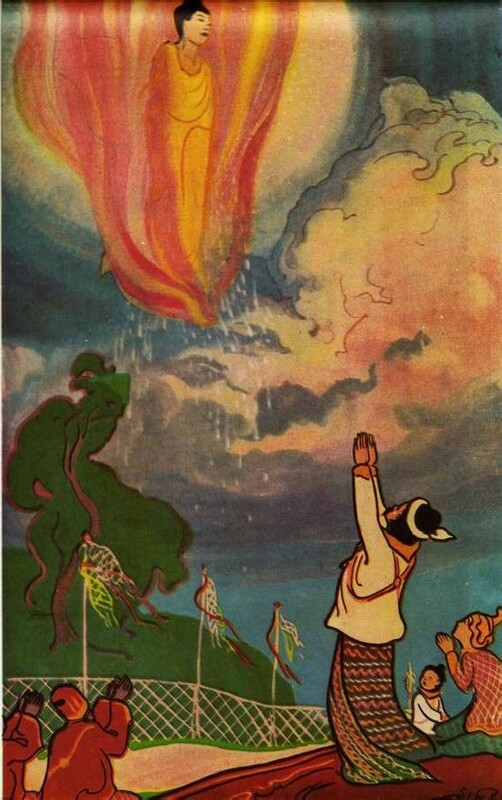 Â Â Â Â Â Â Â Â Â Then the Future Buddha seized hold of his top-knot and threw it into the air, sayingâ€” “If I am to become a Buddha, let it stay in the sky; but if not, let it fall to the ground”. AndÂ Sakka, the King of the gods, received it in a golden casket, and established it in the Heaven of the Thirty-three Gods as theÂ Culamani CetiÂ (Shrine of the Diadem). After that, the Future Buddha put on the robes, the symbol of asceticism, brought by the Maha-Brahma god, Ghatikara, and became an ascetic. His garments, made of Benares cloth, were taken away by Ghatikara, and established in the realm of the higher gods as the “Dussa Shrine”. 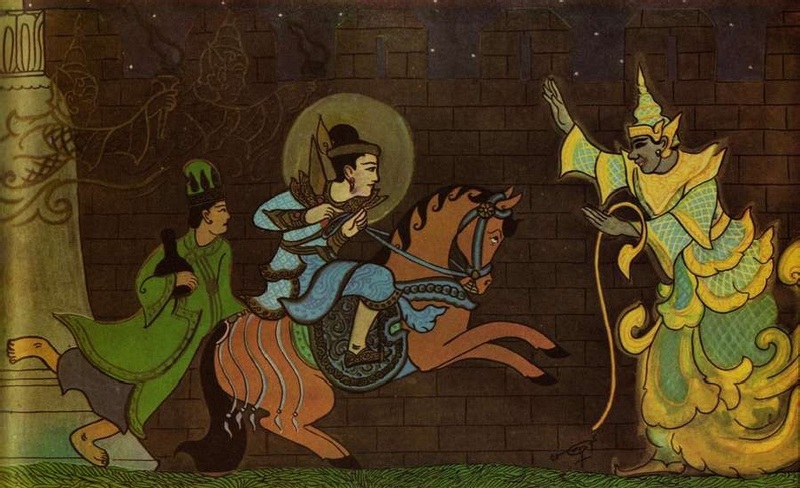 Â Â Â Â Â Â Â Â Â Now the Future Buddha, having thus retired from the world and become an ascetic for about 7 days, entered the city of Rajagaha and begged for food from house to house. By the beauty of the Future Buddha the whole city was thrown into a commotion as he was a distinct contrast to the usual type of ascetics of those days, who were old and shabby in appearance. The Future Buddha being then only 29 years of age and bearing all the signs of a Universal Monarch naturally became an object of admiration and wonder. Â Â Â Â Â Â Â Â Â Now the Great Being having collected some food for his sustenance went to the shade of Pandava rock and ate his meal. 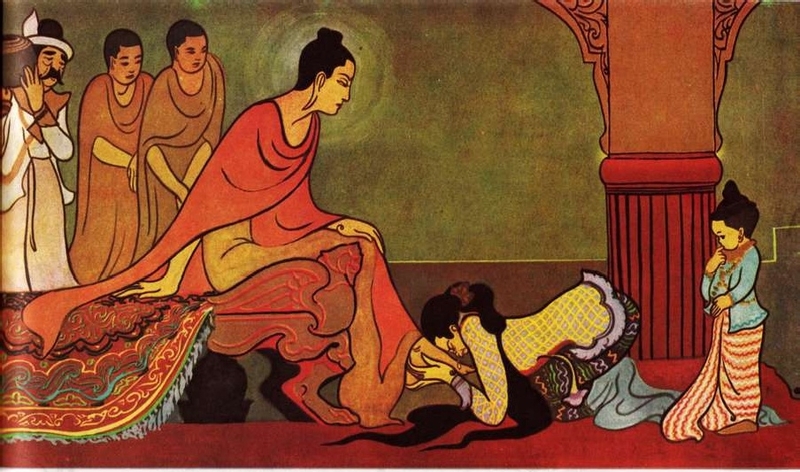 Thereupon,Â Bimbisara, the King, approached the Future Buddha, and being pleased with his princely deportment and appearance offered him all his kingly glory. “Great King”, replied the Future Buddha, “I do not seek for the gratification of my senses or my passions, but have retired from the world for the sake of the supreme and absolute enlightenment of a Buddha”. Having become a monk, the Future Buddha sought for teachers and found two renowned Brahmin teachers,Â Alara KalarmaÂ andÂ Uddaka Ramaputta. He acquired from them the method of meditation leading only to mundane superhuman power. But not satisfied with it, he ceased to practise it. And being desirous of attaining Enlightenment he continued his search and went to Uruvela grove. He entered Senani village and begged for his food from house to house and ate his meal. He thought to himself that having to go on a begging round for food in itself was a hindrance to his ascetic practices and began to practise theÂ Great Struggle. The Great Struggle is an austere practice which is beyond human endurance of an average person. He tried various plans such as, abstaining from rice meal and living on fruits which dropped from trees, then on fruits which dropped from the tree under which he sat, then living on one fruit, one sesamum seed or one grain of rice a day. By this lack of nourishment his body was reduced to skin and bones and lost its golden colour and became dry and black. There lived in the village of Senani, near Uruvela forest, a girl namedÂ Sujata. She had uttered a prayer for fulfillment of her wish at a banyan tree, and vowed a yearly offering to it, if she should have a good marriage and a son as her first born child. The wish having been fulfilled, she used to make an offering every year at the banyan tree. Now the Great Being had resumed taking usual food, because he found that the austerities he practised for full six years were not the way to enlightenment. On the full moon day of the monthÂ VesakhaÂ (April-May), the Future Buddha who had attained 35 years of age, was sitting under the banyan tree. 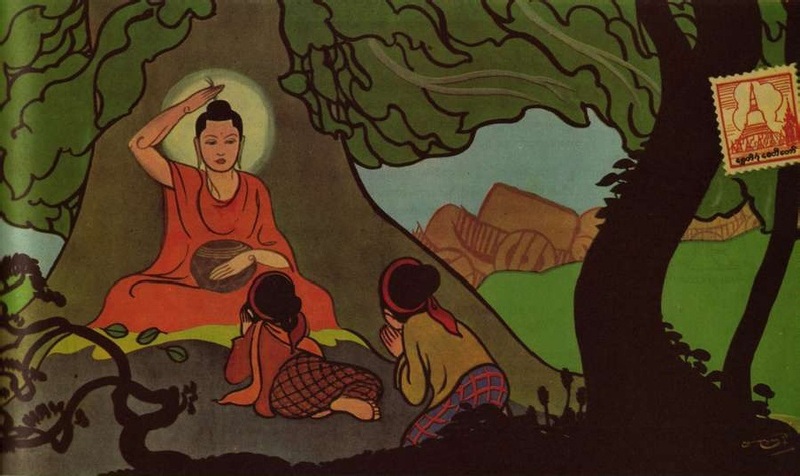 Sujata caught sight of the Future Buddha and, supposing him to be the tree-god, her benefactor, who had come down, offered him milk-porridge in a golden bowl that was worth a hundred thousand pieces of money. He proceeded to the banks of theÂ NeranjaraÂ and ate the food. He took the bowl to the river bank and set it on the river saying, “If today I shall be able to became a Buddha, let this bowl go up stream”. It floated up-stream! 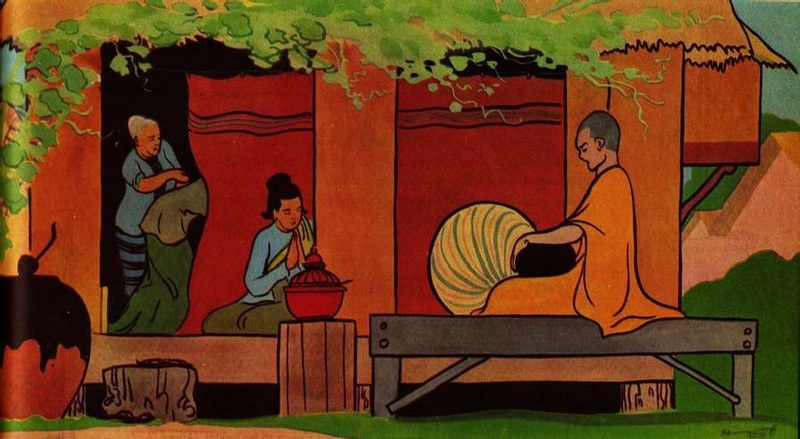 After eating the milk-porridge offered by Sujata, the Future Buddha took his noonday rest on the bank of the Neranjara, in the cool and pleasant shade of a grove of sal trees. And at nightfall he went towards theÂ Bodhi tree. On the way he received from a grass-cutter namedÂ SotthiyaÂ eight handfuls of grass and sat down cross-legged on that grass. He made the mighty resolution: “I will not stir from this seat until I have attained the supreme and absolute wisdom”. Many higher and lower gods with Sakka came near the Future Buddha. The godÂ Mara, the Evil One, saw the Future Buddha seated in that unconquerable position and knew that he was sure to become a Buddha. He went back to his celestial realm and brought his army drawn out for battle. He grasped a variety of weapons himself and sounded the war-cry, “Advance! Seize!” to frighten the Great Being. But the Future Buddha won a peaceful victory over Mara with the power of loving kindness, which he had practised in his many past lives, just as a mother would tame a cruel and wicked son with her maternal love. 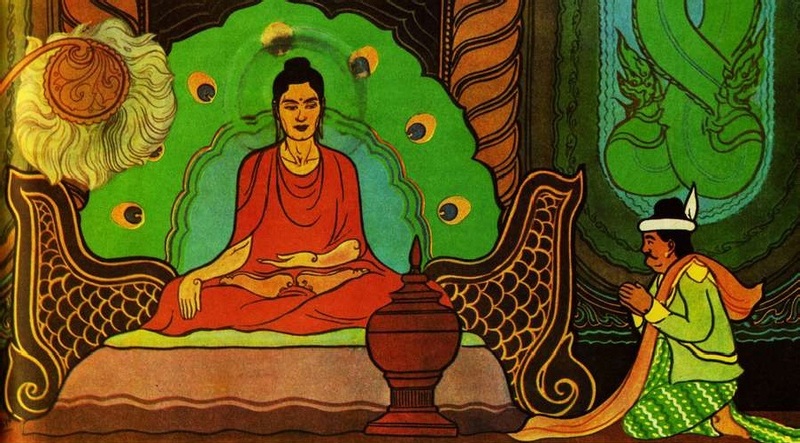 Having vanquished the army of Mara, the Future Buddha sat cross-legged at the foot of the Bodhi tree with the firm resolution that he would not get up from his seat until he attained the supreme wisdom of a Buddha, and went into deep meditation. He acquired in the first watch of the night the knowledge of previous existences; in the middle watch of the night, the divine eye with which he could see the beings of all thirty-one planes of existence dying and being reborn; and in the last watch of the night, he gained the bliss of complete emancipation. Thus on Wednesday the full moon day ofÂ VesakhaÂ (April-May) 103 the Great Era at dawn, the Great Being attained theÂ Supreme EnlightenmentÂ of a Buddha. Not long after his attainment of Supreme Buddhahood, the Blessed One sat cross- legged at the foot of theÂ Rajayatana treeÂ (Buchanania latifolia).Â At that time two brothersÂ TapussaÂ andÂ Bhallika, from a village calledÂ UkkalaÂ went for trade to (the middle Districts of) India where the Buddha was dwelling. A deity who was related to them in a past existence informed the two brothers that the Blessed One had recently attained the Supreme Buddhahood, and directed to the place where the Blessed One was then dwelling. The deity also instructed them to offer to the Buddha the cakes which they had brought with them. 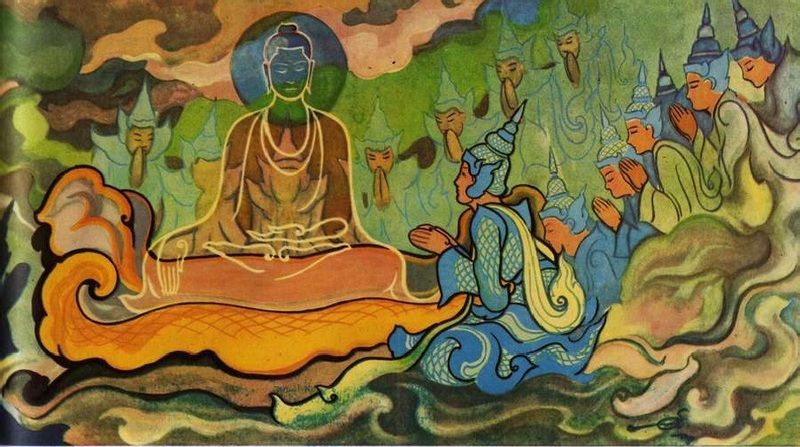 As directed by the deity, the two brothers approached the Buddha and offered the cakes which they had brought They then addressed the Buddha with the words, “We take our refuge, Lord, in the Blessed One and the Dhamma; may the Blessed One receive us as disciples, who from this day forth, while our life lasts, have taken their refuge in Him”. They then asked the Blessed one, “What shall we receive as an object of worship from today, Lord?” The Blessed One rubbed his head with his hand and gave to the two brothers whatever hairs came off and stuck to his hand. 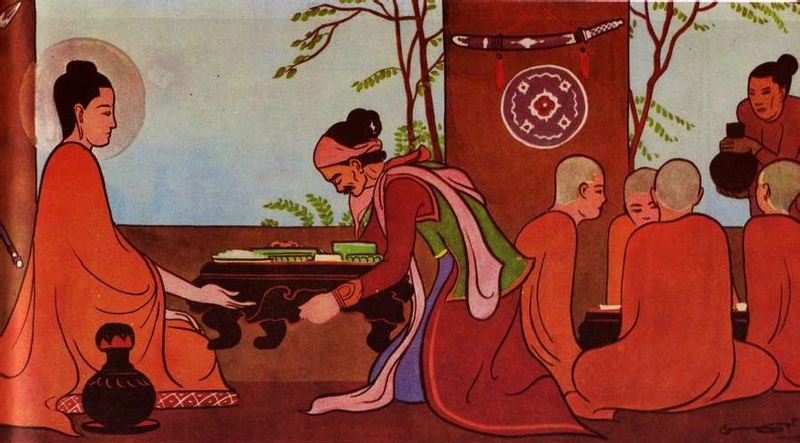 Soon after the birth of the Future Buddha, eight Brahmin fortune-tellers, observed the marks and characteristics of the Future Buddha’s person. Five of these Brahmins interpreted that prince Siddhattha would unquestionably become a Buddha and with that belief, had already become ascetics. When Siddhattha retired from the world, they attended to his personal needs. Then seeing that the Future Buddha had given up extreme asceticism and gone back to the usual way of taking ordinary material food, they doubted if he would ever become a Buddha, and deserted him. Then they went and lived in the Deer Park atÂ IsipatanaÂ near Benares. The Blessed One, having attained the Supreme Wisdom, began his life as the Great Teacher. He first thought of the persons whom he should first aid with his teaching, and saw that these five ascetics had developed mature intellect. He therefore went to the Deer Park at Isipatana near Benares, 18Â yojanasÂ (1Â yojanaÂ =about 8 miles) away from the Bodhi tree and preached hisÂ First Sermonto this “Band of Five Disciples” before sunset on the full moon day of Wazo (June-July).Â KondannaÂ was established in the first noble stage of the Ariyan Path, along with eighteen crores of higher and lower gods. Â YasaÂ was the first born son ofÂ SujataÂ who offered milk-porridge to the Great Being on the very day he was to become the Enlightened Buddha. He had been brought up in the greatest luxury as in the case of the Future Buddha, three separate mansions being provided for three different seasons, namely, the wet, cold and dry seasons. Waking up one night, he found his palace attendants, female musicians, asleep in unseemly conditions, and deeming the scene to be a cemetery, went out from his house and the city to the Deer Park of Isipatana that every night. Yasa came into the presence of the Buddha and, after hearing the sermon from the Blessed One, was established in the first noble stage of the Ariyan Path. 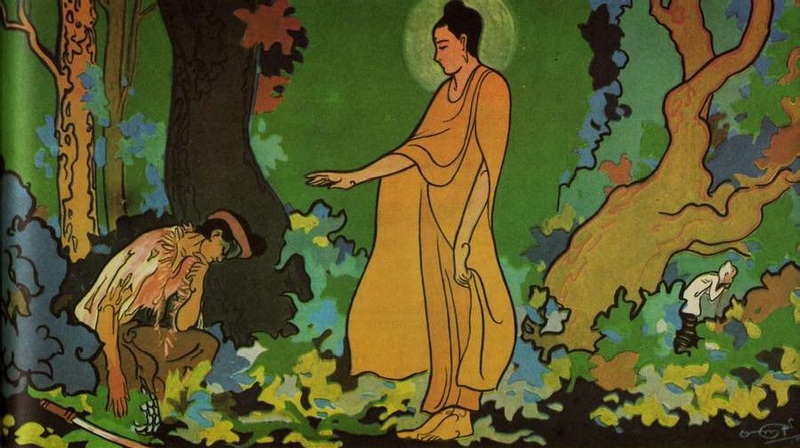 Yasa’s father went in search of his son and came to the Buddha. The Buddha made Yasa invisible with his supernatural power and assuring him with these words, “You will find your son” preached a sermon to him. Yasa’s father was also established in the first holy stage of the Aryan Path, while Yasa was established in the fourth holy stage of the Aryan Path. The Blessed One then discontinued the use of the supernatural power with the result that the father met the son, and ordained Yasa as a monk at his request. (18) BHADDA-VAGGIYA BROTHERS WENT SEARCHING FOR A WOMAN, AND WERE CONVERTED BY THE BUDDHA. 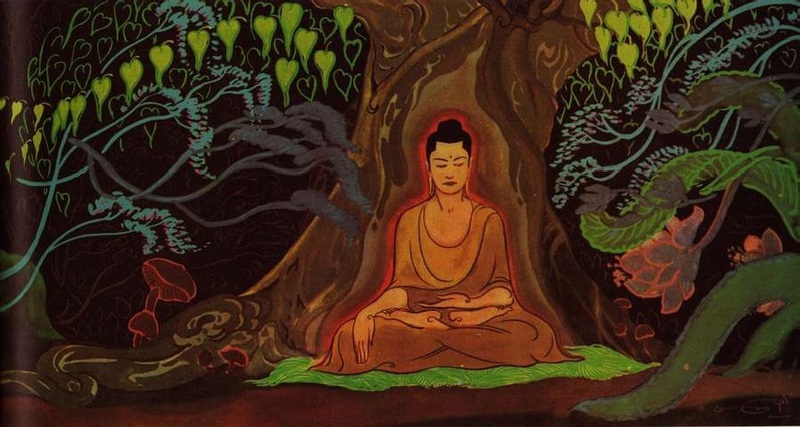 The Buddha went back from Benares to Uruvela, and on his way he entered a grove and sat under a tree. At that time, thirtyÂ Bhadda-vaggiyabrothers, who were born of the same father asÂ King PasenadiÂ of Kosala, were sporting with their wives in that grove. One of them had no wife and they had brought a courtesan for him, but while they were not noticing she had taken their bag of valuables and fled. They came seeking her, and when they came near the Blessed One they inquired, “Did you not see a woman ?” “What do you think, young men,” Buddha replied, “which is better for you, to go in search of a woman or to go in search of yourselves?” The brothers admitted, “It is better to go in search of oneself’. Buddha then told them to sit down and preaching to them the evils of sensual indulgence, converted and ordained them as monks of the Holy Order. After the Buddha had kept his retreat at the Deer Park atÂ Isipatanaduring the first rainy season, there were fullyÂ sixty ArahantsÂ besides the Blessed One. He called them and said. “Released am I, O Bhikkhus, from fetters both human and divine. Ye also are free from fetters both human and divine. Go ye, now O Bhikkhus, and wander for the gain of the many, for the good of the many, for the gain and welfare of gods and men. Preach, O Bhikkhus, the doctrine which is glorious in the beginning, glorious in the middle, glorious at the end, in spirit and in letter. Proclaim the Holy Life altogether perfect and pure. There are beings with a little dust in their eyes, who, not hearing the Doctrine will fall away. There will be those who will understand the Doctrine”. With this exhortation the Buddha despatched His first sixty disciples in various directions. After sending forth the Arahants to preach, the Blessed One went to Uruvela to convert a thousand hermits headed by the threeÂ Kassapa brothersknown as Uruvela Kassapa, Nadi Kassapa and Gaya Kassapa. 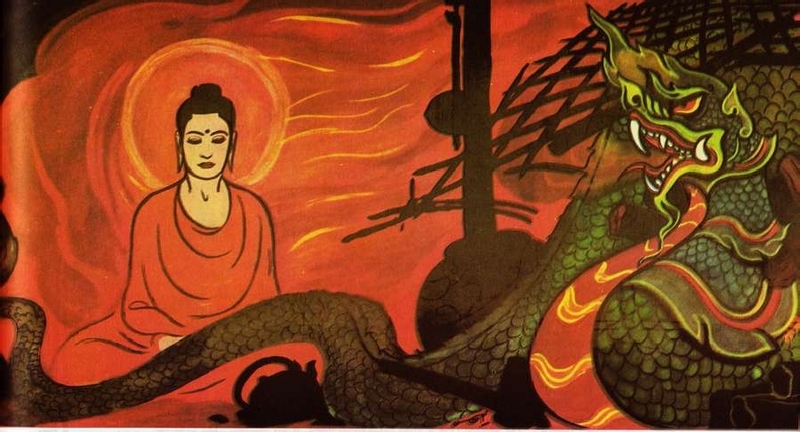 The Buddha tamed the King of the Dragons in a fire-shed by using a variety of his supernatural powers. The thousand hermits became monks and with this retinue, the Blessed One proceeded to Gayasisa. On arrival there he preached to them again and they all became arahants. The Buddha went from there to Rajagaha accompanied by those monks and dwelt in the Toddy Palm Grove. King Bimbisara went there with a large following of 120,000 persons to pay his respects to the Buddha. 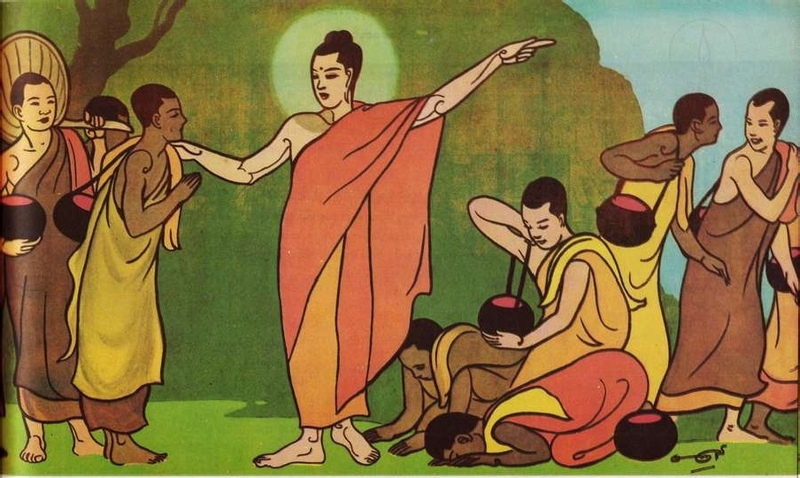 As the ascetic Kassapa was held in high esteem by his people, he was at a loss to understand whether the Buddha was a disciple of Kassapa or the latter was a disciple of the former. TheÂ Venerable KassapaÂ knew this and placing his head upon the Buddha’s feet acknowledged the Buddha’s superiority, saying, “My teacher, Lord, is the Lord, I am the disciple” repeatedly. Â SariputtaÂ andÂ MoggallanaÂ were the two most distinguished of the Buddha’s disciples and were well-known as his two chief disciples. Before they met the Blessed One they were leading the religious life under Sanjaya as wandering ascetics in search of truth. One day Sariputta saw theVenerable AssajiÂ going round Pajagaha early in the morning for alms, with decorous walk and perfect deportment. He thought, “Surely this is one of the monks who are arahants, or who have entered on the path of arahantship”, and followed in the wake of this monk. When the Venerable Assaji had taken his meal, Sariputta drew near and spoke to him as follows:â€””Who, brother, is your teacher and whose doctrine do you approve?” The Venerable Assaji replied, “The Blessed One, a great Sakayaputta monk, is my teacher. The Doctrine proclaimed by the Blessed One I approve. It shows suffering, cause of suffering, cessation of suffering and the path leading to the cessation of suffering”. On hearing this exposition of the Doctrine, Sariputta was established in the first holy stage of the Ariyan Path. Then Sariputta went to tell his friend the good news and Moggallana was also established in the first holy stage of the Ariyan Path. Both of them with a large following of their disciples became monks under the Doctrine and Discipline of the Buddha. “My officers, go ye to the areas where disturbances have taken place and people have fled from the village, and restore law and order and give people protection so that they can live safely in their villages and work their fields again under normal conditions”. He gave orders not to kill the insurgents but to protect the inhabitants. The army sallied forth and, after stamping out the disturbances by peaceful means as commanded by the King, came back safely to the capital. King SuddhodanaÂ heard that the Buddha was dwelling at the Veluvana Monastery offered by King Bimbisara of Rajagaha. He wanted to see Him. Nine courtiers, each with a large following, were sent on nine successive occasions to invite the Buddha to Kapilavatthu. All nine attained Arahantship and no reply was received. The King finally despatchedKaludayi. He went on condition that he would be allowed to enter the Order. Kaludayi also became an Arahant and entered the Order. He then requested the Buddha to visit the city of Kapilavatthu. The Buddha proceeded there with a following of twenty thousand Arahants covering a distance of 60Â yojanasÂ at the rate of oneÂ yojanaÂ a day. It took him fully two months to do the journey. Kaludayi Thera traveled by air everyday by superhuman power and kept the Buddha’s father, Suddhodana, informed of the progress of the march. And on the day of the Buddha’s arrival, a great welcome awaited Him. 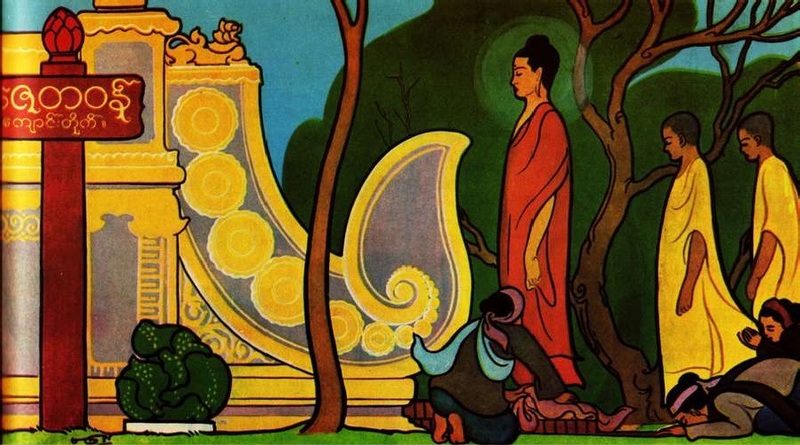 Members of the Sakya clan were very proud, and when the Buddha arrived at Kapilavatthu, they let only the younger kinsmen pay their respects to the Blessed One while the older folk sat down without making obeisance to Him. The Blessed One, who saw this behaviour, rose in the air and walked over the heads of the elders. He performed theÂ miracle of the pairs, in which flames of fire came from the upper part of His body and streams of water from the lower part. Then the process was reversed. Next fire came out from the right side of His body and water from the left, and so on. He thus showed his superhuman power and emitted six resplendent rays of light from his body, at which they marveled. Suddhodana himself was so deeply moved by the sight that he bowed his head and touched it with the feet of the Blessed One in salutation. At this, all the other members of the clan could not help paying homage to the Blessed One. The sky then became overcast with clouds and poured down a shower of rain by which only those who wished to be wet became wet and not others. They marveled at this miracle and showed greater respect towards the Buddha. 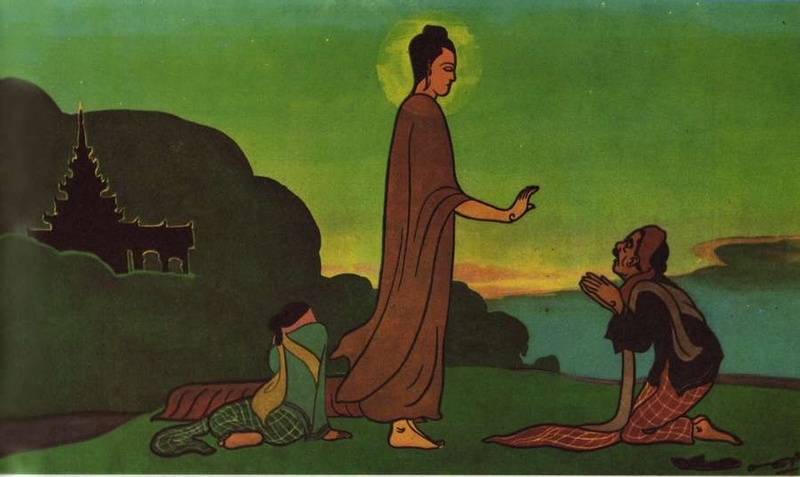 The day after his arrival at Kapilavatthu the Buddha went on His alms round. 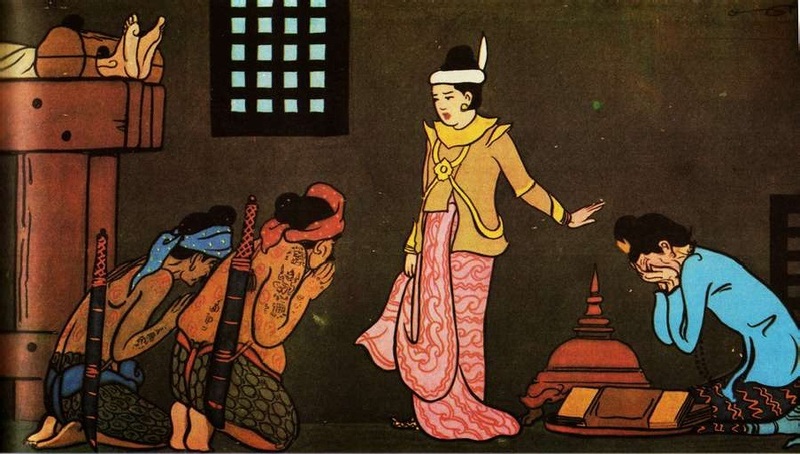 King Suddhodana came and conducted Him to the palace and served Him with food. After the meal there was great excitement in the palace and all butÂ Princess YasodharaÂ came to pay their reverence to the Buddha. Yasodhara thought, “Certainly if there is any virtue in me, the Noble Lord Himself will come to my presence. Then will I reverence Him as much as I like”. The Buddha saw that if He did not visit her, Yasodhara would break her heart with grief. So He handed His bowl to the King, and accompanied by His two chief disciples entered the chamber of Yasodhara and sat on the prepared seat, saying, “Let the King’s daughter reverence as she likes”. Swiftly she came, clasped His ankles, and placing her head on His feet, reverenced Him as she like. 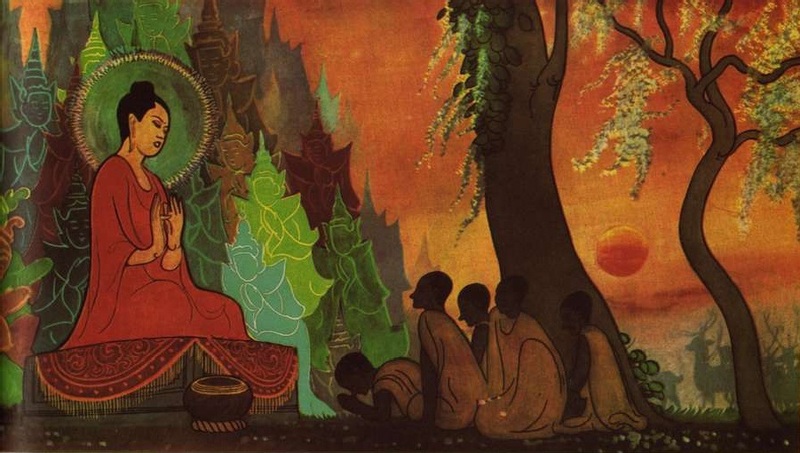 While the Buddha was having his meal at his father’s palace.Â Princess YasodharaÂ dressed upÂ RahulaÂ properly with ornaments and pointing to the Buddha said, “Behold, son, that great ascetic of majestic appearance in the midst of twenty thousand monks. He is your father. The vases of gold belonging to Him have disappeared since the day he retired from home to homelessness. Go ye and ask for your inheritance so that you may become a Universal Monarch”. Young Rahula, emboldened by the love of a son towards his father, came to His presence and said, “O, father, your shadow is cool and pleasant. I wish to become a Universal Monarch. Please give me my inheritance”. He asked for his inheritance, uttering much else that was becoming. He followed the Buddha when he went back to the monastery asking for inheritance. But the Blessed One made him owner of an inheritance transcending this world, by ordaining him as a samanera (novice) of the Holy Order. After the attainment of Supreme Buddhaship by the Great Being,NandaÂ and many other princes of the Sakya clan became monks under the discipline of the Blessed One. It therefore appeared to those households of the same clan, with two or three sons in each family, that they would be failing in their duty if none came forth to be ordained. The two brothersÂ MahanamaandÂ AnuruddhaÂ discussed this subject, and Anuruddha agreed to be ordained.Bhaddiya, who was then a ruling monarch, happened to be an intimate friend of Anuruddha. Anuruddha therefore went to King Bhaddiya and persuaded him to become a monk along with him, and Bhaddiya agreed. Accordingly, seven of them includingÂ Ananda, Bhagu, Kimila, DevadattaÂ andÂ Upali, the barber, came to the Buddha. There they made their request that Upali be admitted first, in order that their Sakya pride might be humbled through having their former attendant as their senior. They were then ordained accordingly. Â PippaliÂ was destined to becomeÂ Venerable MahakassapaÂ who would protect the dispensation of the Dhamma after His death. He was in charge of 14 villages of workmen and a section of the fighting forces. He belonged to a very rich family worth several crores of money and together with his wife retired from home-life to lead a religious life. There was a mighty earth-quake at the place where Pippali parted with his wife on retirement from the world. 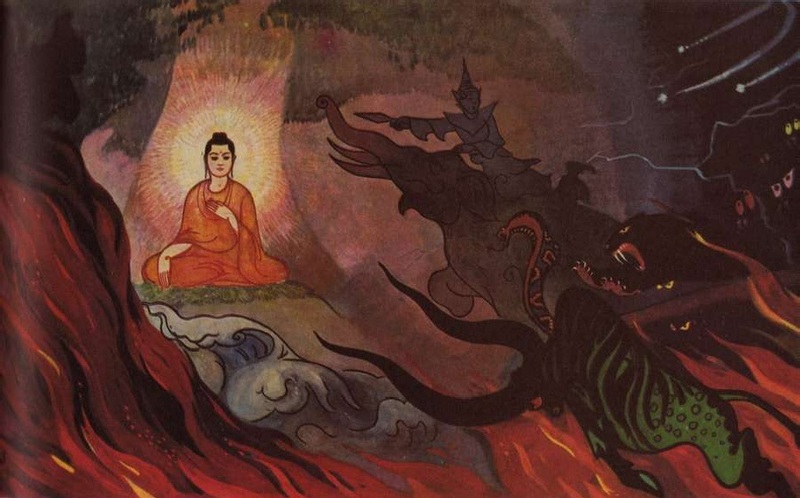 The Buddha surveyed with His Buddha-eye and saw the cause of the earth-quake. 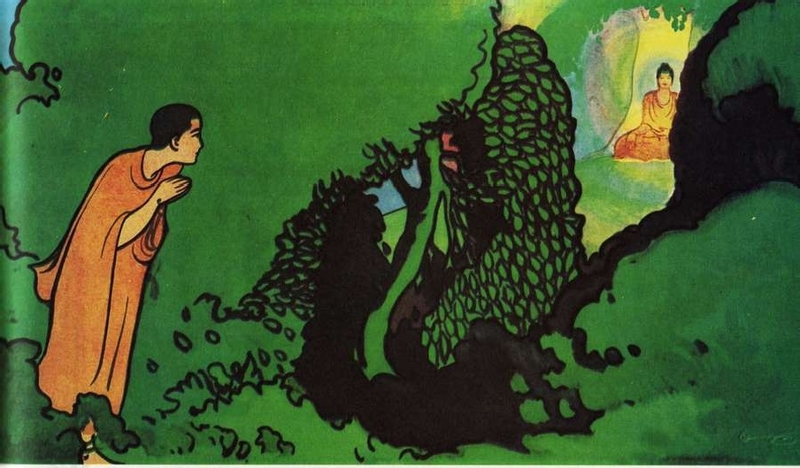 Immediately thereafter the Buddha went lo the giant banyan tree about 3Â gavutasÂ away (about six miles) to welcome Pippali. He then sat at the foot of the tree causing the six resplendent rays of light lo issue forth from His body. Pippali, who later came to be known as Mahakassapa. saw the Blessed One and, coming to this decision: “He indeed is my master”, placed his head upon the feet of the Blessed One and said, “Lord, I am your disciple”. The Buddha often honoured him before the assembly of monks by treating him as a member of the Holy Order of a standing equal to Him. Â Â Â Â Â Â Â Â Â There was scarcity of rain atÂ VesaliÂ (modern Besrah) and many people died from the effects of famine which attacked it. The offensive smell from the corpses brought demons and ogres into the town and there were more deaths. To make matters worse, a disease very much like modern plague broke out, and there were still more deaths. The people discussed ways and means of relief from attacks of famine and disease. They eventually agreed to invite the Buddha for that purpose. and requested the Blessed One to come over from Rajagaha together with his retinue of monks. When the Blessed One arrived at Vesali in the royal barge there was a heavy downpour of rain which washed away all the corpses and the town had become clean. 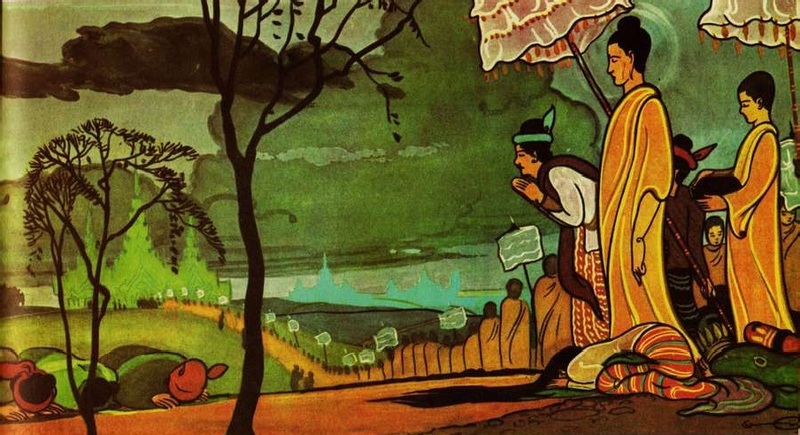 On arrival at the city gate the Venerable Ananda learnt theÂ Ratana Sutta ParittaÂ and recited it by walking round the city in between its three walls, and sprinkling the holy water from his bowl now and again while going round the city with the Licchavi Princes accompanying him. Thus, all the evil spirits were driven away from the city which was rendered free from diseases. 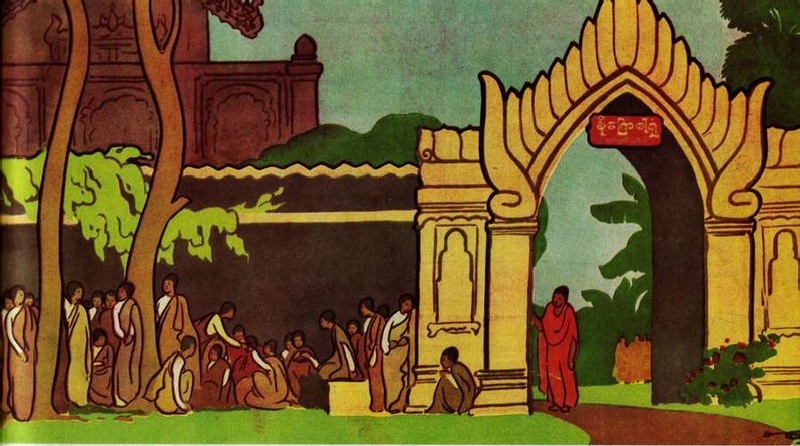 The Buddha was dwelling atÂ KapilavatthuÂ in Banyan Park Monastery.Maha-pajapati GotamiÂ approached the Buddha along with five hundred women of the Sakya clan, and begged permission for women to be admitted into the Order as Nuns. The Buddha refused permission saying, ‘Enough, O Gotami, do not ask that women be admitted into the Order as Nuns”. She went away sorrowful and sad. Later, when the Blessed One was dwelling at Vesali, Mahapajapati Gotami had her hair cut off, put on yellow garments and with five hundred of Sakya women followed to Vaseli. She dared not enter the monastery grounds and stood outside the porch. 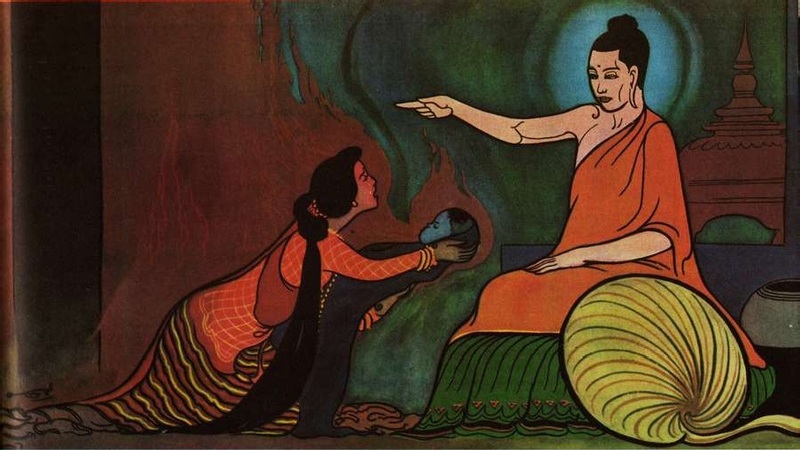 Now the Venerable Ananda saw her standing there, and went to the Buddha and asked several times for permission to admit women into the Order as Nuns. At last, the Blessed One gave the permission and women were admitted to the Order. Thus anÂ Order of Nunswas founded. Â Â There was in Vesali an ascetic calledÂ Saccaka, well-versed in a variety of dogmas and philosophies. He was a teacher of the princes. As he had humiliated many heretical teachers of the day, he was planning to defeat also the Blessed One in argument. He met the Venerable Assaji one day and came to know about the doctrine of the Blessed One. He therefore came to the Buddha in order to have a debate on the doctrine. A great crowd came to watch the results of the debate. During the debate, the Blessed One said, “Matter or form is insubstantial (that is, there is no such thing as a creative soul)”. The ascetic refuted it by saying “There is a creative soul”. The Blessed One then said, If there is a creative soul, why does it not create a beautiful form?” The hermit could not rebut it and sat quietly. The Buddha asked him for the second time and he still kept quiet. Now Sakka, lord of the gods, came and, assuming the form of a huge demon, threatened to strike him with his celestial weapon. When he was questioned for the third time he admitted that “matter or form is insubstantial”. The Buddha was dwelling in Rajagaha, at the end of the first rainy season. Now,Â Anathapindika, the Millionaire, arrived in Rajagaha in connection with business. He heard that the Blessed One had attained the Supreme Wisdom of a Buddha, and had a strong desire to go to Him that very night, but could not do so. He went to bed with his thoughts fixed on the Blessed One. 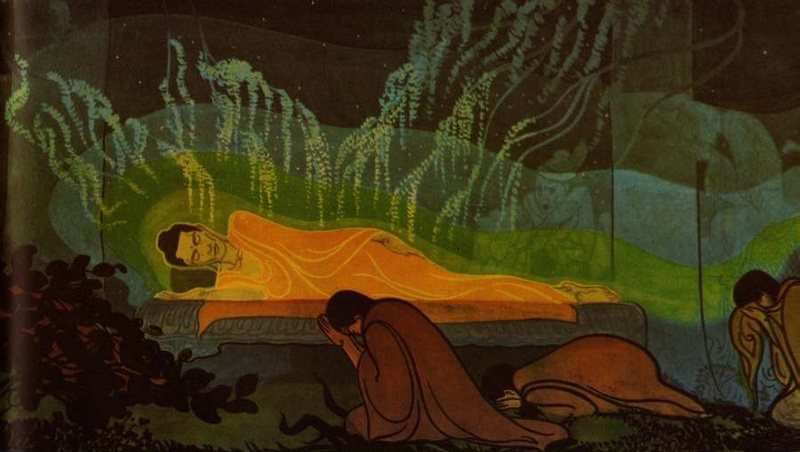 His faith in the Buddha was so intense that he could not sleep well and was between waking and sleeping, when a light emanated from his body. Thinking it to be daylight he went to where the Blessed One was. When he met the Buddha, he was established in the first holy stage of the Ariyan Path. 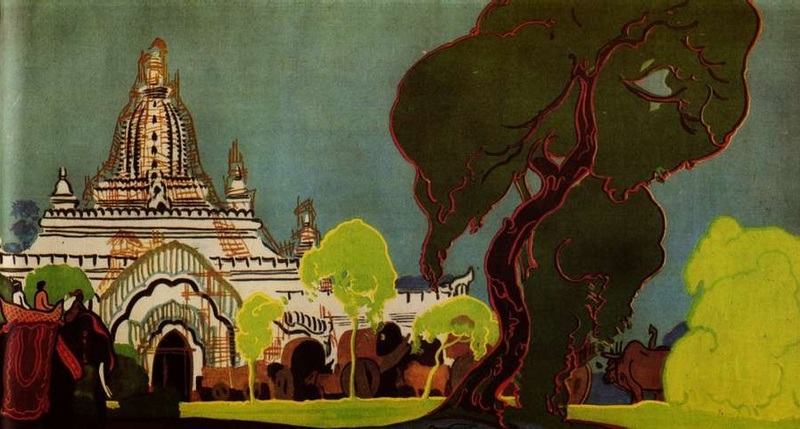 He came back, at once, to Savatthi and looked for a site to build a monastery, and found a park belonging to Prince Jeta, in a very quiet place, well connected with roads and neither too near nor too far from the town. He bought this park covering the whole site with gold coins and erected the famous Jetavana Monastery at great cost. He donated it to the Buddha and his many disciples after inviting them to come over from Rajagaha. 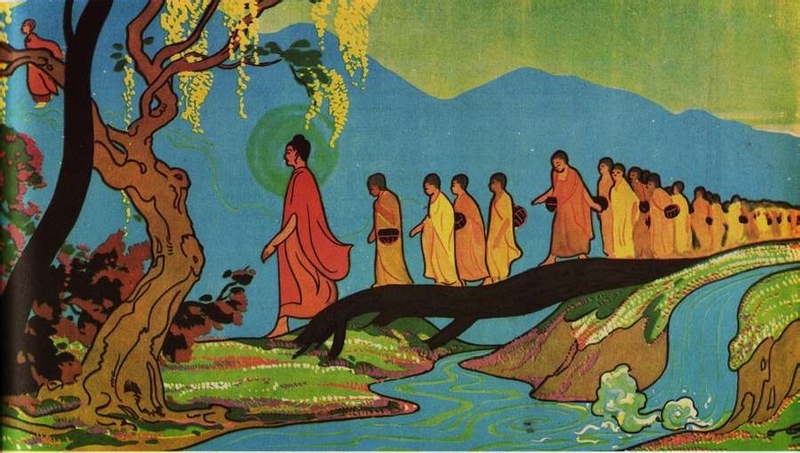 Even before the Blessed One had attained the Supreme Enlightenment of a Buddha, there were six heretical teachers who wandered about towns and villages and deceived many people by professing themselves to be Buddhas. When they arrived at Savatthi, the ministers who had faith in these wandering ascetics informedÂ King KosalaÂ that their teachers were all Buddhas. 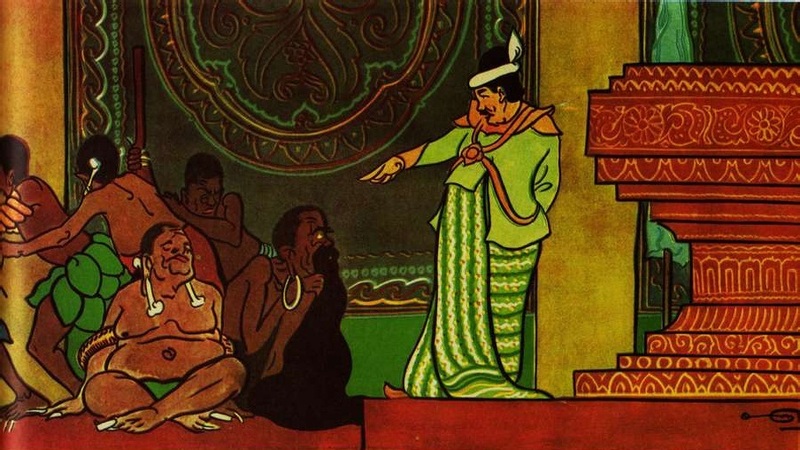 King Kosala said to the ministers, “Please invite your teachers yourselves and bring them to this palace”. When these heretical teachers arrived at the palace, they dared not sit upon the magnificent seat of the king and some of them sat upon the floor, while others sat on the carpets. The King saw how they were seated and guessed that none of them could be the Buddha. He asked them a direct question, “Do you admit that you are the Buddha or deny it?” They frankly admitted, “We are not the Buddha”. They were then allowed to leave the palace in peace. The Buddha was dwelling at the Jetavana Monastery after his first arrival at Savatthi upon the invitation of Anathapindika, the Millionaire. At that timeÂ King KosalaÂ came to the Buddha and asked “Venerable Gotama, do you also admit that you are the all-knowing Buddha?” The Blessed One replied, “If you call any person as Buddha, you will be calling it correctly only if you call me so”. King Kosala then said. “Even elderly teachers of sects such as Purana Kassapa, Makkhali Gosala, Nigantha Nataputta, Sanjaya Belatthaputta, Pakudha Kaccayana, Ajita Kesakambala, do not admit themselves to be the Buddha. 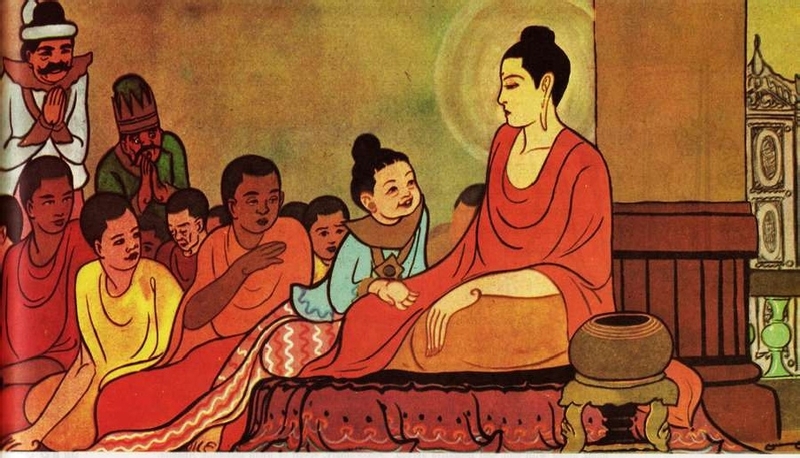 Why should you Venerable Gotama, since you are younger than those teachers, admit that you are the Buddha?” The Buddha said, “A Prince, a fire, a snake and a virtuous monk should not be treated lightly with disrespect though small”. Â Nandopananda, king of the dragons, was dwelling on Mount Meru in magnificent splendour and luxury like a god. He was full of anger. 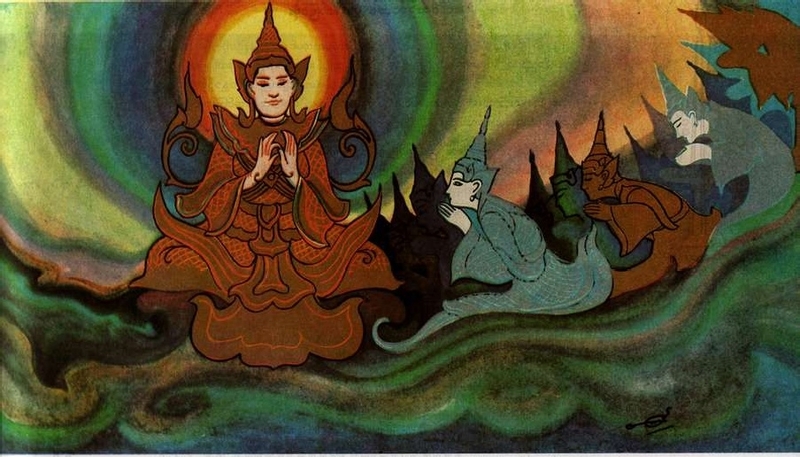 One day while he was in the midst of his pleasures surrounded by dancing female dragons, the Buddha, together with a retinue of monks with supernatural powers, traveled by air to Tavatimsa heaven and passed over their heads. This made the king of the dragons very angry, and he coiled his body roundMount MeruÂ andÂ Tavatimsa heavenÂ and covered them. In the midst of their aerial journey, the holy monks could not see Tavatimsa heaven which was covered by the dragon-king. They knew this and asked the Blessed One to allow them to tame him, but did not get the permission. Only theÂ Venerable MoggallanaÂ got the permission when he requested the Buddha. 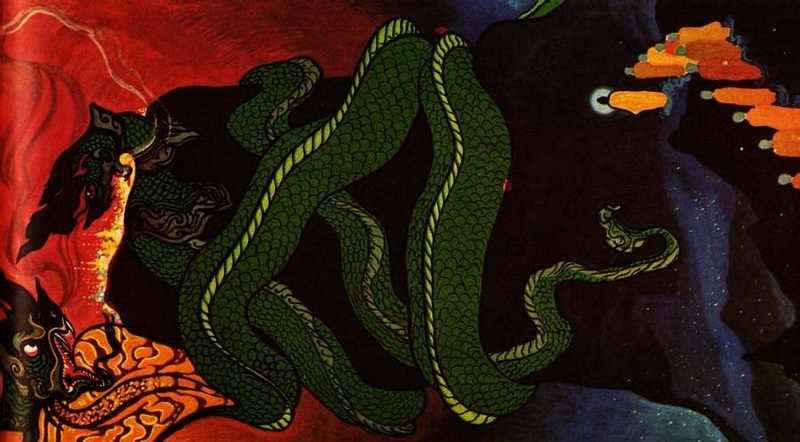 He then turned himself into a dragon, with a body much larger than that of the dragon-king, and coiling himself round the dragon-king’s body, began to crush him down. By this and other means he tamed the dragon-king and taught him a good lesson. He then brought him to the Blessed One and made him take refuge in the triple gem, namely, the Buddha, the Doctrine and the Order of Monks. Baka BrahmaÂ was the chief of the first realm of higher gods. He was of the view that his realm was the highest and that he himself and his realm were everlasting, not knowing that there were higher realms above his own. The Blessed One visited the Brahma world and in the midst of an assembly of higher gods pointed out to Baka Brahma, “There are realms of higher gods above yours. The whole Brahma world of higher gods including your realm is not permanent”. Then the Blessed One continued his discourse to Baka Brahma by saying, “I know how you have come into being and what your powers are. But, there are higher gods superior to you in status and power”. Finding that all his views were wrong, Baka wished to show his own powers and said. “I will make myself invisible”. He made several attempts to become invisible, but without success. The Blessed One then said, “I will now show you that I can make myself invisible”, and instantly the Buddha disappeared from view and preached to him a sermon while remaining invisible. One monk was suffering from dysentery. As he did not wait upon others, there was no one to wait upon him. 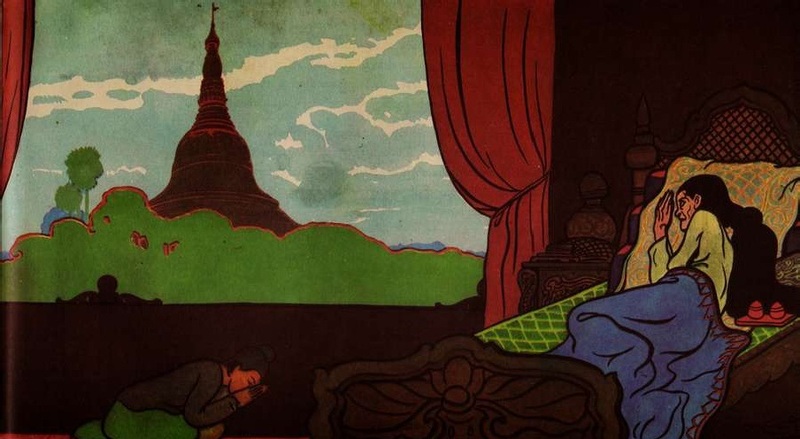 The Buddha, accompanied by the Venerable Ananda, went round inspecting the buildings of the monastery and saw the ailing monk sleeping in filth. 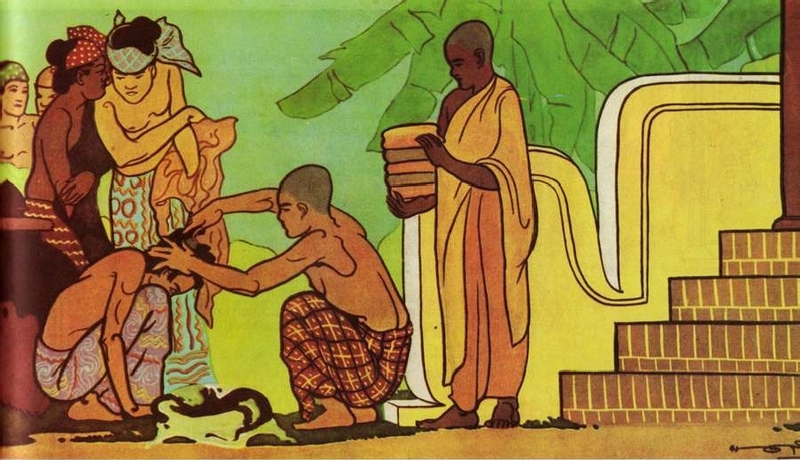 Immediately the Blessed One sent the Venerable Ananda to fetch water and Himself poured water while the Venerable Ananda scrubbed and cleaned him. 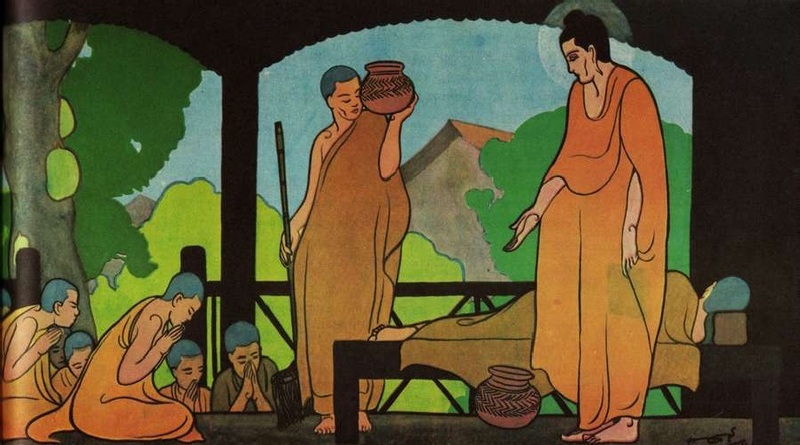 The Buddha and the Venerable Ananda thus did their duty of ministering to the sick. 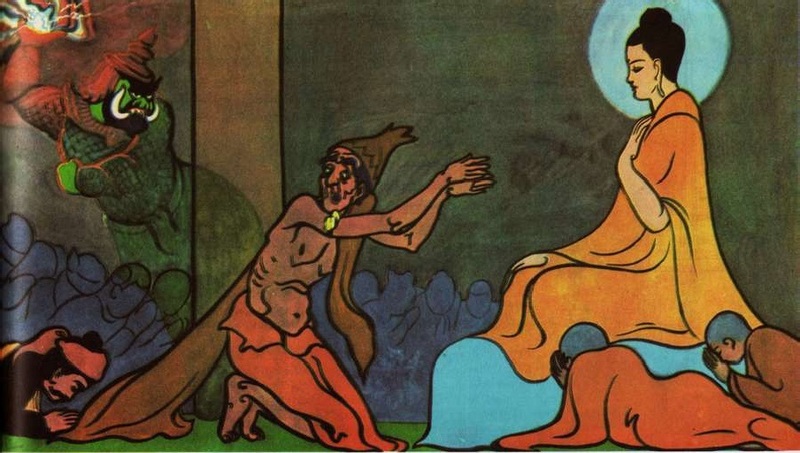 Having washed and cleaned the monk, the Blessed One held him by the head, while the Venerable Ananda took hold of his feet and placed him on a couch. The Buddha had the monks assembled and exhorted them thus:â€””You have no parents nearby to wait upon you, and if you do not wait upon one another, who will do so?” And then the Blessed One admonished them as follows:â€” “Whosoever, Brethren, would wait upon me, he should wait upon the sick”. AngulimalaÂ was the son of the Kings Chaplain of the Savatthi City, and a student of the Taxila University. The teacher and his wife were very fond of him, as he was a brilliant, clever and faithful pupil. Unfortunately his associated grew jealous of him, made up a false story and succeeded in setting the teacher against him. The enraged teacher, suspecting him to have had an affair with his wife contrived to put an end to his life by ordering him to fetch a thousand fingers as a present in return for the education he received. In obedience to the teacher, he took to the forest of Savatthi and started killing people to collect fingers for the necessary offering. Later he wore a garland of these fingers to ascertain the numberâ€”hence the name Angulimala. When he had collected 999 fingers, and was ready to complete the number he chased his own mother who came out to ask him to desist from killing. The Buddha saw this in advance and appeared on the scene to prevent him from killing his mother. 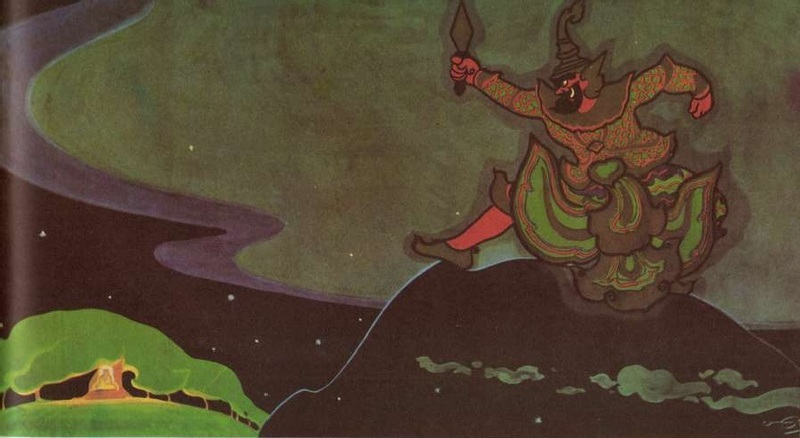 He chased the Buddha to kill Him, but could not overtake Him on account of His supernatural power. He was eventually converted to the noble Doctrine of the Buddha and was admitted into the Order. Angulimala led a peaceful life after he had become a monk. But most of the people were still scared of him and dared not approach him on his alms-round. He therefore found it difficult to get enough food for his meals. 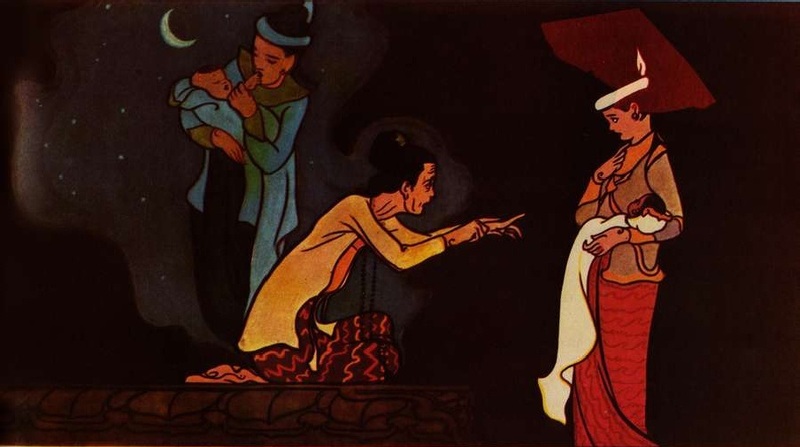 One day as he went on his alms-round, he saw a woman in the throes of childbirth. Moved by compassion, he reported this pathetic case to the Buddha who then taught him theÂ Angulimala ParittaÂ in Pali which means:â€”” Sister, from the day I was born of the Noble Birth, (i.e., since my Ordination), I have not consciously deprived any living being of life. By this truth may health be to thee and thy unborn child”. He studied this Paritta, and going to the presence of the suffering sister sat on a seat separated from her by a screen and made this asseveration by reciting the Paritta in Pali. Instantly she was delivered of the child with great ease. After that he had enough food on his alms-rounds and was contented and happy. There dwelt in Savatthi city, a female ascetic calledÂ Cinca-manavika, who was as pretty as a goddess. 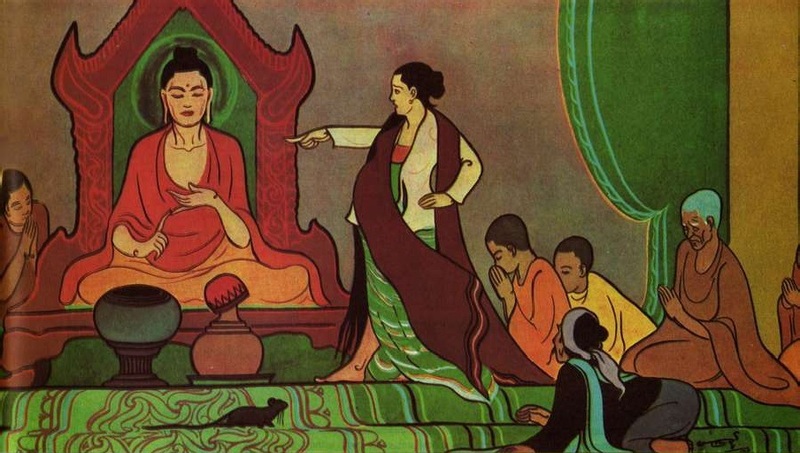 The heretical teachers, who did not get enough alms and were envious of the Buddha attempted to destroy His reputation by setting her to make a false accusation against Him. 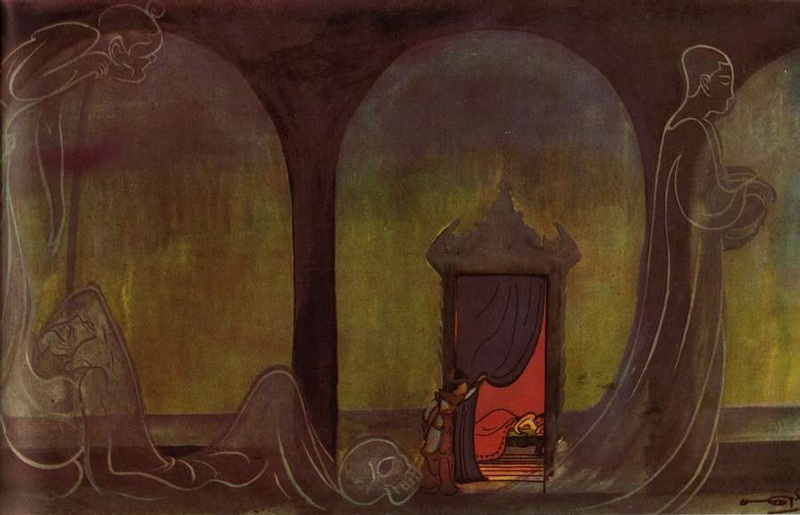 She wrapped a scarlet shawl round her and pretended to pay visits to the Buddha at Jetavana Monastery at nightfall, though, as a matter of fact, she slept at the monastery of the heretical teachers, and at day break she entered the city as if she was coming back from the Buddha at Jetavana Monastery. In this way she caused doubts to arise in the minds of devotees returning in the evening from the monastery after hearing a sermon from the Buddha, and those who were going there early in the morning to pay their respects to the Buddha. After a period of about nine months she placed a wooden knob against her stomach and tied it with an apron round her body to make it appear that she was big with child. 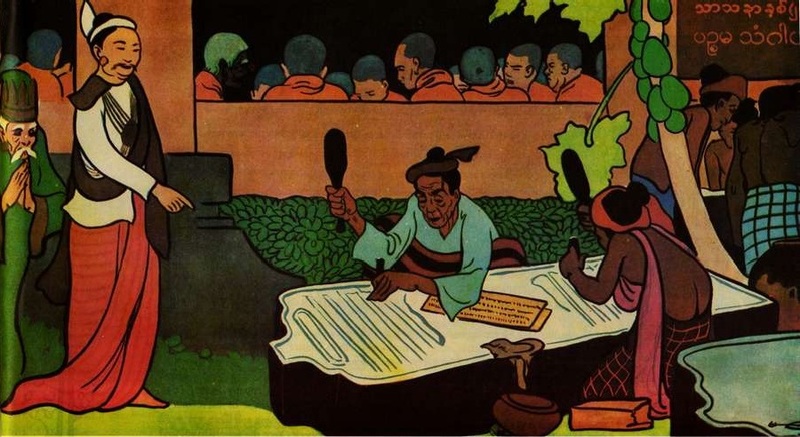 Then she approached the Buddha who was preaching and made a false and wicked accusation thus: “Why have you not prepared my confinement room?” The gods appeared as mice and bit loose the apron round her body, when the knob of wood fell before the audience, and she was given a sound beating and driven away. Â The daughter ofÂ King MaddarajaÂ of Sagala State, by the name ofKhema, was one of the queens of King Bimbisara. She was very pretty and being proud of her own beauty, had no wish to go to the Buddha, who was in the habit of preaching that “beauty is but skin deep”. But she heard that Veluvana Park had been greatly improved and was looking so picturesque and pleasant that even gods were attracted by it. She therefore had a strong wish to visit it and went to the park where the Buddha was then in residence. 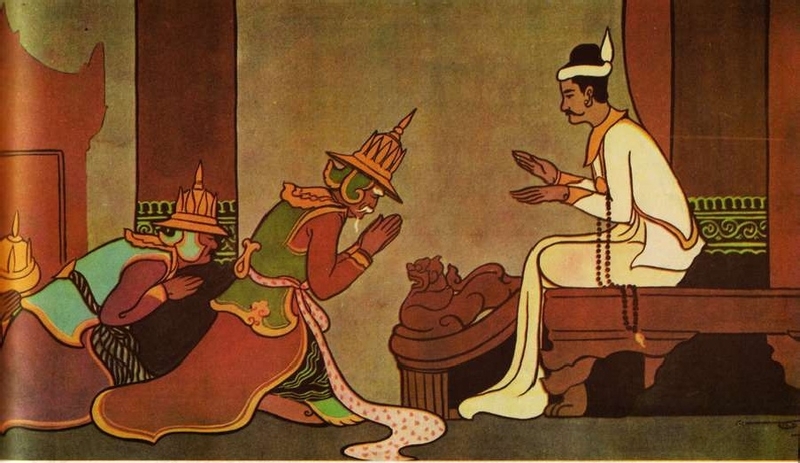 King Bimbisara had told the attendants to see that the Queen should not come back without paying her respects to the Buddha. 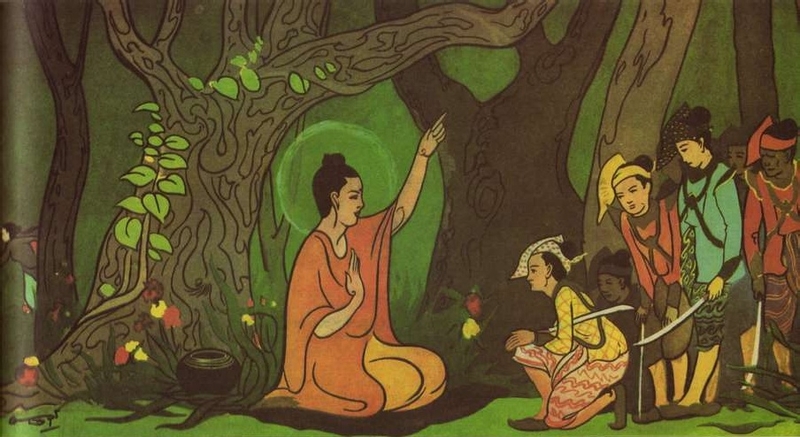 She dared not disobey the King and approached the Buddha before she left the Park. The Blessed One, with his superhuman power created a scene in which a woman, more handsome than the queen, was fanning him. The woman then becoming older and older, fell down through infirmity and began to moan. The queen was very much startled by the sight. The Buddha then preached a sermon to her, and she became an Arahant and was admitted intoÂ the Holy Order of Nuns. Â Rohini riverÂ lying betweenÂ KapilavatthuÂ andÂ KoliyaÂ was the main source of water supply for these two cities to irrigate their lands for growing crops. At one time, when the crops became dry, the farmers from both cities went to draw water from the river when there was very little water and just enough left for them to take once only. A quarrel arose over it and there was an exchange of hot words touching the fair name of the Sakya clan. The Ministers including the one in charge of agriculture became so angry that they decided to settle this matter by battle and both sides sallied forth for a fight. Â Kisa GotamiÂ was the wife of a wealthy man of Savatthi worth 40 crores. She had an only son who died when he was just able to run about. She had never seen any death and, thinking that her son was only ill, did not cremate him. In her distress she took him in her arms and went about asking for medicine. One wise man thought that no one but the Buddha would know of any, and sent her to Him. 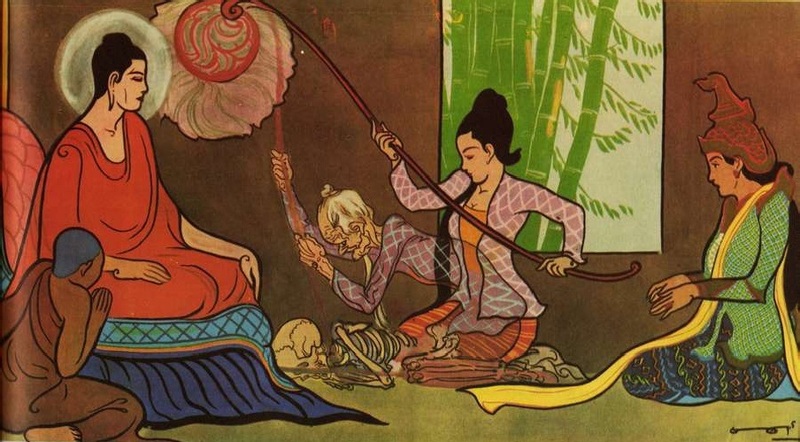 Kisa Gotami showed her dead son and asked the Buddha to give the medicine that would cure her boy. The Buddha answered: ” I shall cure your boy if you get some mustard seeds from a house where no one has died”. Carrying her dead son, she wondered from door to door. But she could not find any house where no death had occurred. At last she began to learn the truth, “No house is free from death”. 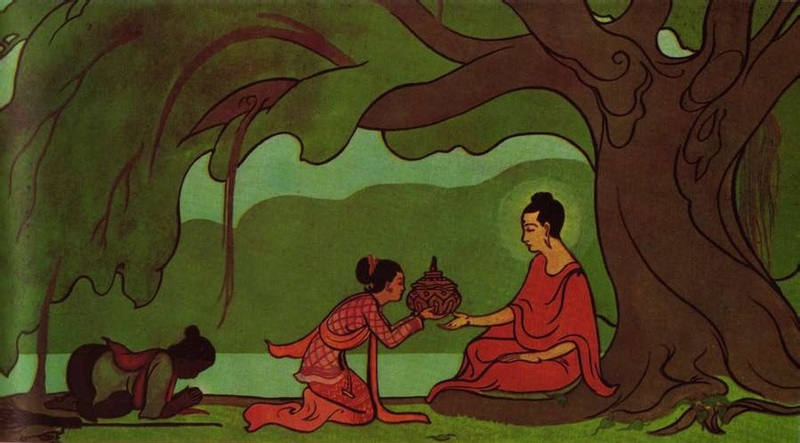 She went to a wood, laid her child there and returned to the Buddha, who comforted her by preaching to her the truth. She was established in the first holy stage of the Aryan Path, and was admitted intoÂ the Order of Nuns. She eventually became an Arahant. There stood a giant banyan tree at a distance of a little more than three miles from Alavi city.Â Alavaka, the demon-god had his dwelling in that tree. One night Alavaka was attending a meeting of gods at the Himalayas, when the Buddha entered his dwelling in order to tame this cruel monster. The door-keeper of the dwelling, a deity, paying homage to the Buddha, said, “May I go and seek permission from Alavaka for you to enter his dwelling?” So saying, he went to the meeting of gods to get the permission. “Alavaka am I!” Then throughout the night he flung all sorts of weapons at the Blessed One who was not hurt at all because of his infinite power of loving-kindness. 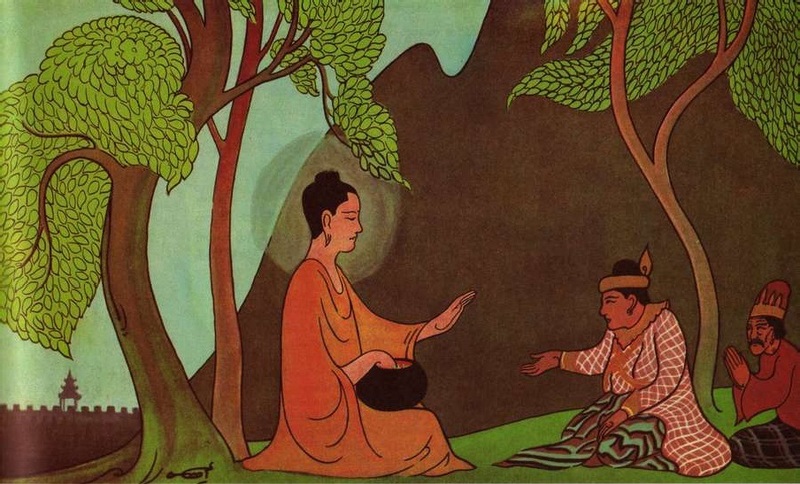 Then Alavaka approached the Buddha who tamed him peacefully with a sermon on Loving-Kindness. A General called “Siha” of Vesali was an important lay devotee of the teacher known asÂ Nigantha Nataputta. He heard of the virtues of the three gems namely, the Buddha, the Doctrine and the Order from a gathering of Licchavi princes. Accordingly he asked his teacher to allow him to go to the Buddha, but was not allowed to go. He asked for permission for the second time but it was again refused. On the third occasion, however, without asking for permission he proceeded to where the Buddha was, with many followers in five hundred chariots. When he came to where the Buddha was he asked the Buddha several questions on points which were not clear to him and was thoroughly satisfied with the answers given. He then said, “I take my refuge, Lord, in the Buddha, the Doctrine and the Order. May the Lord receive me as a disciple who, from this day forth while his life lasts, has taken his refuge in them?”. After that the General requested the Buddha to visit his house on the morrow together with his retinue of monks to partake of food. He then, out of a very generous heart, served them with an excellent meal the next morning at his house. Soon after he had ordained as a monk,Â Venerable DevadattaÂ practised meditation and attained superhuman power and even the six higher psychic powers. Because he possessed those powers he wanted to become a rival and take the Buddha’s place as the leader. Being eager for gain and honour he thought he would achieve his purpose by winning overÂ Prince Ajatasattu, still a youth but with sure prospects of accession to the throne. Devadatta assumed the form of a lad with a girdle of snakes, and terrified Ajatasattu by appearing in his lap. He then comforted the Prince saying, “Oh, Prince, don’t get alarmed. I am the person known as Venerable Devadatta.” He then assumed his proper form as a monk with the bowl and robes, and stood in front of the prince. Ajatasattu marveling at the wonder paid him great honour, and sent him 500 dishes daily. Devadatta secured more than enough alms according to his original plan. Venerable Devadatta instigated Prince Ajatasattu to kill his fatherKing BimbisaraÂ as he thought that, if the Prince became King in succession to his father, he would be able to take the place of the Buddha. The Prince was of the view that whatever his teacher Devadatta said was good, and was on his way to carry out his plan to murder his father. His father questioned him and the Prince admitted that he plotted to kill him because he wanted to become King. King Bimbisara gave up the throne in his favour. After that, Venerable Devadatta told him that he would be able to rule without any risk of losing the throne only if his father was no longer alive. Prince Ajatasattu was impressed with this suggestion. But he did nor wish to kill his father straightway. So he caused his father to be cast in prison. At first, the Princes mother, the Queen was permitted to visit the King in person and he could lake his meals. But, finally, the Queen was not permitted to visit the King any more, and the King kept himself fit by walking up and down inside the prison. Ajatasattu, however, ordered that the soles of the King’s feet be cut open with a knife so that he could not walk. King Bimbisara died soon after the soles of his feet had been cut open with a knife. At the same time a son had been born toÂ King Ajatasattu. The courtiers brought two messages: one, about the death of his father and the other about the birth of his son. They first presented him the message about the birth of his son. Love sprang in his heart upon his new-born son, right from the very marrow of his bones. He then began to have sympathy for his father, placing himself in the position of his father with regard to himself when he was a baby. He, therefore, gave the order :- “Set free my father at once”. But the courtiers presented to him the message of his father’s death, and he regretted very much for his hasty action. He, therefore, went to his mother and asked her, “Mother, did my father love me when I was a baby?” The Queen Mother then said, “What a question you have asked’?” When you were young and had a sore called willow in your finger, your father kept it inside his mouth. The sore burst inside his mouth and pus came out ; even then instead of spitting the matter out he swallowed it lest it would cause you pain by taking the finger out”. When she said this, both the mother and the son wept together. After the death of King Bimbisara, Devadatta made several attempts to kill the Buddha, but he was not successful. So he went to the elephant-keepers and said to them. “Venerable Theras like us who are recognized by the King can use our influence to get you promotion in your service. Therefore, you had better carry out my instructions. If the Venerable Gotama should pass this way, set the full grown male elephant,Â Nalagiri, upon Him”. Nalagiri was a very ferocious elephant which used to gore men to death. 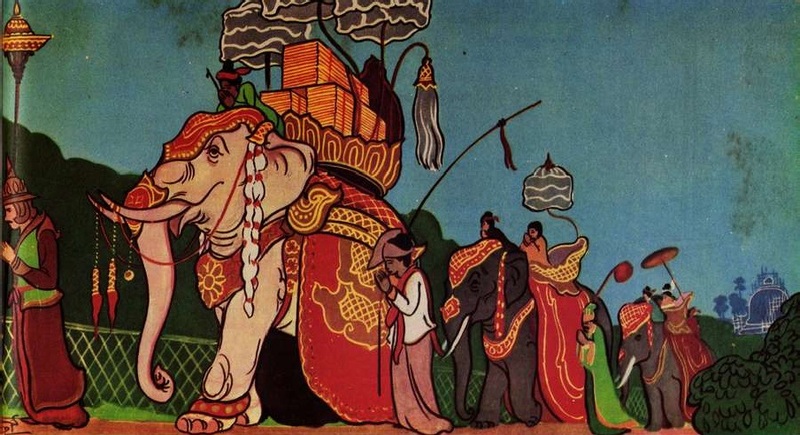 The Blessed One, with his retinue of holy monks, was coming into the city of Rajagaha on his alms-round, when the elephant-keepers, desirous of gaining promotion in service, set the full-grown elephant in the direction of the Buddha. The Blessed One stood where he was and sent out his thought of loving-kindness towards the elephant Nalagiri, which was running towards him to crush him down. 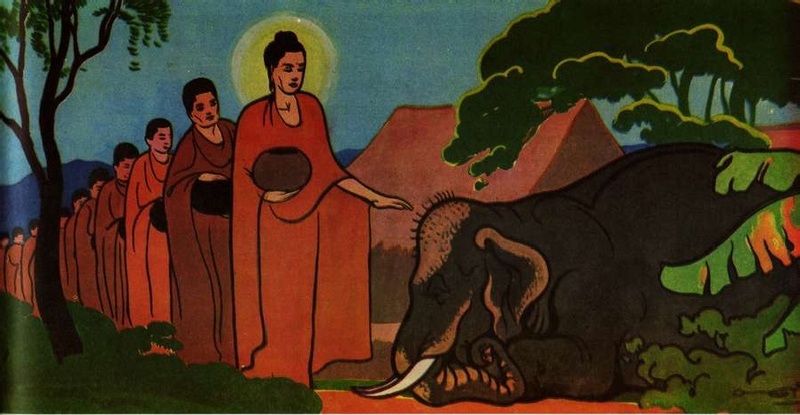 When the elephant came near the Buddha, it stood quietly before Him listening to the words of advice uttered by Him. The courtiers made several suggestions to him but he did not accept any of them. 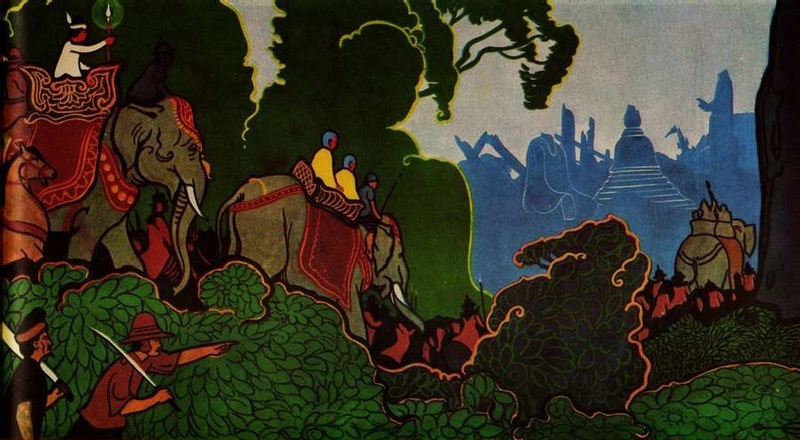 He took the suggestion of theÂ Physician Jivaka, and left the city with a procession of five hundred female elephants, fully bedecked and caparisoned, and mounted by five hundred women disguised in the dress of soldiers; and accompanied by torch-bearers to show the way. When he arrived at the Mango Park of Jivaka, he saw the Blessed One and over one thousand holy monks so quiet and peaceful that the sight at once filled his mind with peace and hope. The Governor of Payasi was of the wrong belief that there was no future world, that there were no such beings as higher and lower gods produced without any apparent cause, that there was no such thing as Hell and that there were no effects of good or bad deeds done. According to his view “if a man dies he is not reborn”. Venerable Kumara Kassapa was an Arahant who could preach well. The Governor of Payasi with a great crowd of men came to the Arahant and stated to him his religious views. Venerable Kumara Kassapa pointed out to him the sun and the moon and asked him, “Are the sun and the moon you see over there in this or another world? Are the beings living there human or celestial?” The Governor could not answer that the sun and the moon were in this world ; nor could he say that their inhabitants were human beings. He had, therefore, to admit that “those planets are in another world and their inhabitants are celestial beings”. He was converted from his wrong faith by being asked questions of this nature. From His 35th year, the date of His Enlightenment, the Buddha’s successful ministry lasted 45 years. When He attained His 80th year the Buddha had an attack of dysentery and lay down on a couch with its head to the north between twin sal-trees in the Sala Grove of Kusinara State. Men, higher and lower gods and monks were gathered, in large numbers, near the Blessed One in respectful adoration. Though he was very weak and weary, the Buddha was still addressing those present with words of exhortation. After addressing them the whole night the Blessed One spoke His last words, when it was nearing dawn, as follows:â€””Behold, O disciples, I exhort you. Subject to decay are all conditioned things. Strive on with heedfulness”. The Buddha then attained the Ecstasies and arrived at the cessation of perception and sensation, and finally the Blessed One passed away; and there was an earthquake to mark His death. 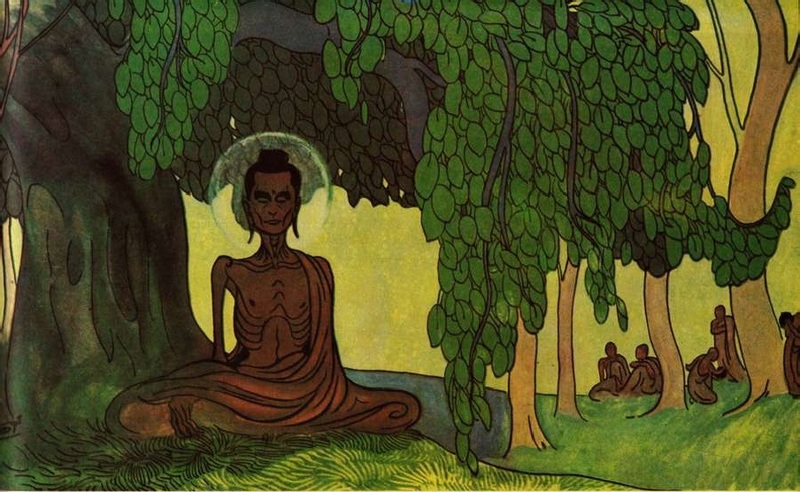 Just before the Buddha passed away, he made a resolute wish that, “the bones of my body may be left over as relics in small bits” so that posterity may reverence them. Ajattasattu and other rulers heard of the Buddha’s death and came out with their own armies to fight for the possession of the sacred relies of the Buddha, if they should fail to get them by peaceful means. Dona the Brahmin was a virtuous professor who happened to have been a teacher of those rulers. There was a great excitement and disorder amongst the crowds present who were preparing to loot the relics. Now Professor Dona got up on an eminence and shouted at the crowd in an authoritative tone, when the din was silenced. Then he spoke to the crowd beginning with the words, “Listen to me, your teacher. Our Lord, the Buddha, used to preach on forbearance”. Then as agreed by the rulers of the eight states, the Professor distributed the sacred relics to them. They took the relies away and placed them inside pagodas and shrines and revered them as objects of worship. 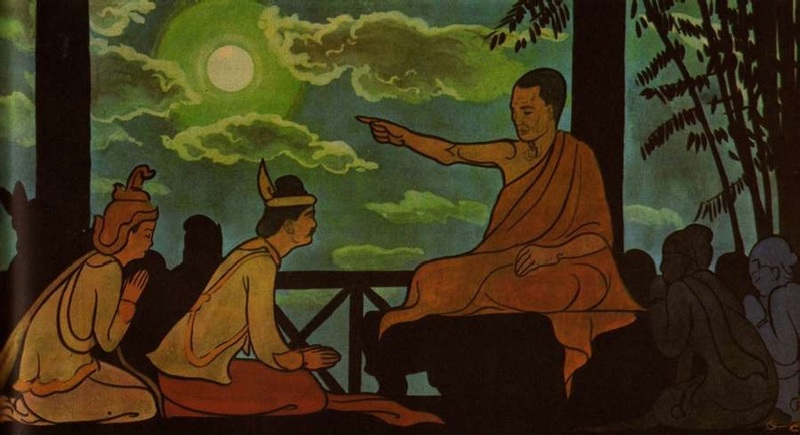 These unexpected words that fell from the lips of a disciple alarmed the Venerable Mahakassapa who became very concerned about the future of the Buddha’s religious system, but kept quiet. 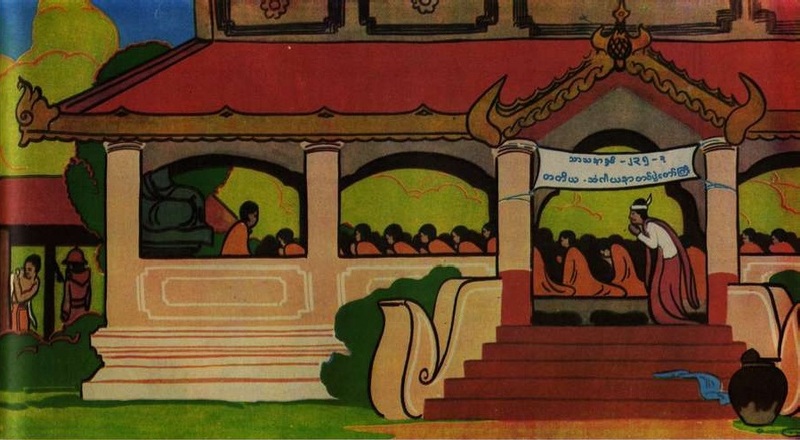 When the Buddha’s relics had been distributed, the Venerable Mahakassapa consulted the other Theras and suggested to them to hold a Council of leading Arahants to collect, classify and rehearse the teachings of the Buddha in order to protect and fortify the Sasana against such attacks as might be expected from monks of the type of Subhadda. They all welcomed the suggestion. King Ajatasattu was informed of the intention of the Samgha, and with his help, the First Buddhist council was held at Rajagaha with 500 Arahants. About 100 years after the death of the Buddha, monks of the Vajji clan did certain acts which were not becoming of monks. They begged for money, even an anna (a nickel) or two, from lay devotees who came to the monastery on Uposatha days to keep their precepts. The Venerable Yasa then said that it was not fit for monks to handle money. For that reason, they imposed a Vinaya Act on the Venerable Yasa by which it was made obligatory for the person who said so to tender an apology to lay devotees for alleged interference with their charitable motives. 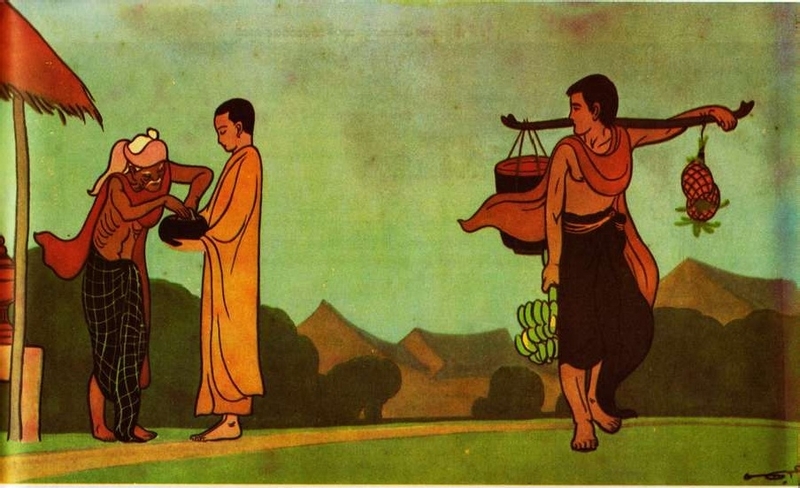 The Venerable Yasa went to the lay devotees and explained the true purport of the Buddha’s teachings, and when the lay devotees understood it they showed no further respect to monks who begged for alms in cash. The Venerable Yasa approached the distinguished Arahants and asked them to adjudge the matter, and they pronounced that it was not lawful according to the Vinaya for monks to handle money. After which, 700 distinguished Arahants were chosen and the Second Buddhist Council was held to protect the Doctrine. King AsokaÂ regularly fed the Brahmin priests, in accordance with the custom of the royal household, before his conversion to Buddhism. But he was not pleased with their demeanour at meal-time, as they were neither clean nor calm. The King thought to himself, “Charity on such a lavish scale should be given in proper quarters”. Later, one day he saw a serene-looking young novice, quietly walking along the street with restrained senses. The King was so impressed with the deportment that the novice was invited to the palace at once and requested to occupy a suitable seat ; and the novice went up the throne and sat on it. The King then served him with an excellent meal and asked him to give an exposition of the Doctrine which his Teacher used to preach. The young noviceÂ NigrodhaÂ delivered an instructive discourse on the following stanza of the Dhammapada:â€” “Heedfulness is the path to Deathlessness. Heedlessness is the path to death. The heedful do not die, the heedless are like unto the dead”. The word of the Buddha appealed to him and he became a Buddhist and staunch supporter of the religion. King DhammasokaÂ understood the essence of Buddhism, and gave great support to the cause of Buddhism by erecting rock-edicts in all parts of his territory enjoining upon the subjects to follow the Doctrine in their daily lives. With his royal patronage Buddhism flourished, and the Sasana gradually grew in importance and numbers. Tempted by worldly gain, many undesirables of alien sects joined the Order and polluted the Sasana by their corrupt lives and heretical views which they taught. Good monks could not live together with these sham monks and there was trouble. The King consulted theÂ Venerable Moggaliputta TissaÂ to protect the Sasana. The King tested the monks and disrobed the undesirables to purify the Sasana.Â The Third Buddhist CouncilÂ was then held by 1000 Arahants. with the Venerable Moggaliputta Tissa as the presiding Thera. The Mahatheras selected 500 monks who were in their prime of life and sent them to accompany the King. King Vattagamani carried on battle while at the same time attending to the personal needs of the Theras in his company with regard to their food, medicine, etc. The spear used by the King contained a sacred relic of the Buddha embedded in it at its end. His motto runs thus:â€””I have been doing my best to make Buddhism last long and not for my own personal gain”. 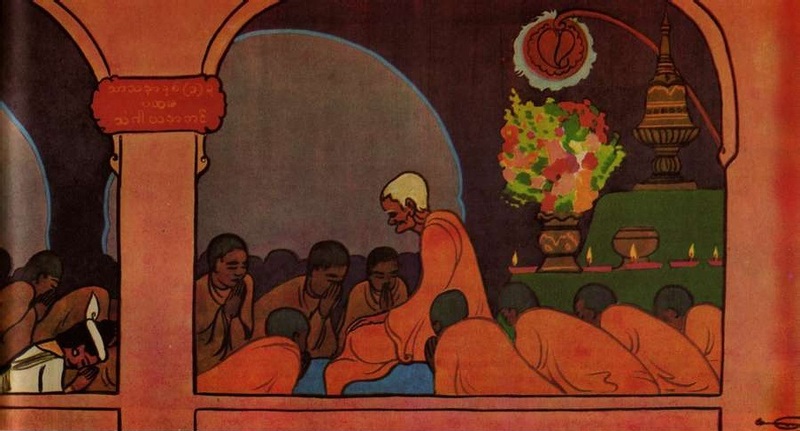 From the time of Buddha’s life down to the time of King Vattagamani’s reign, the Tipitaka forming the teachings of the Blessed One were handed down from generation to generation of monks by word of mouth, by being learnt by heart. During the reign of King Vattagamani, however, trouble was given by Brahmana Tissa, who rose up in arms and there was also inference from Kings who were disbelievers in the Buddhist religion. The monks could not get enough food for their meals and had to make extraordinary efforts to retain in memory whatever parts of the Buddhist scriptures they had already learnt by heart. Â Â Â Â Â Â Â Â Â This was a matter for anxiety as, if the monks in future could not commit the Tipitaka scriptures to memory and recite them, the scriptures might disappear altogether. They therefore sought the assistance of King Vattagamani and heldÂ the Fourth Buddhist CouncilÂ by committing the Tipitaka to writing on ola (palm) leaves. 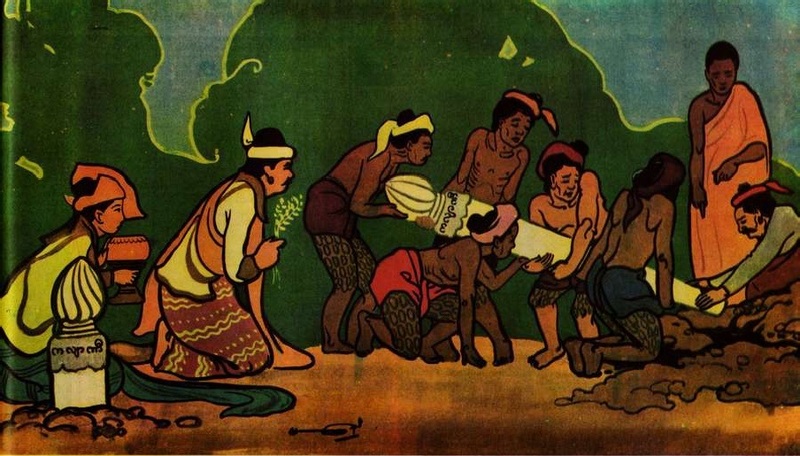 Â Â Â Â Â Â Â Â Â The expression “Writing committed to palm leaves” has come into usage with reference to this first act of the letters of the alphabet being written down on ola (palm) leaves. 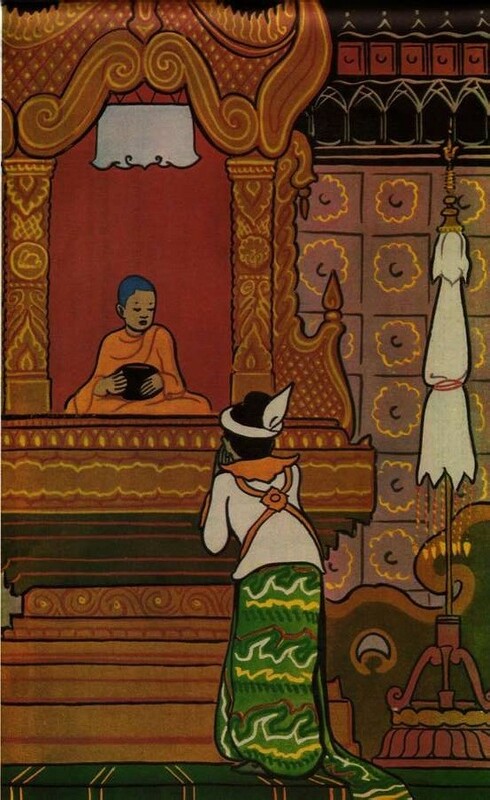 King AnawrathaÂ of Pagan conveyed the Buddhist scriptures from Thaton to Pagan for the benefit of all beings. 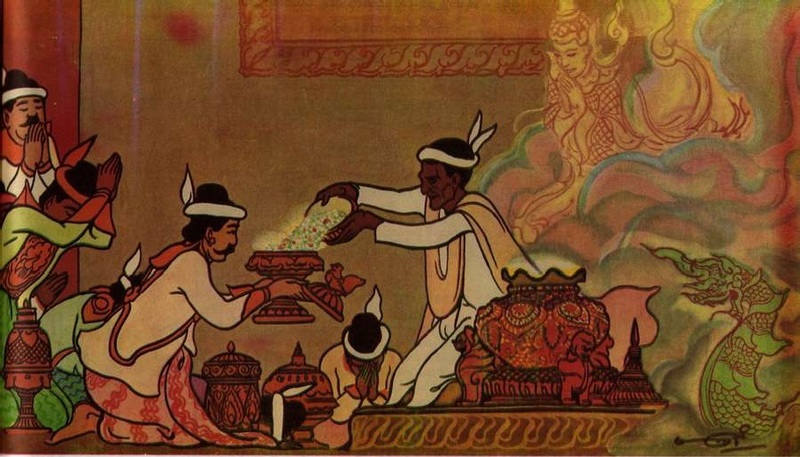 He then removed the frontal bone, sacred relic of the Buddha, fromÂ Kaung-hmu-daw pagodaÂ at Prome built byÂ King Dutta-baungÂ and took it also to Pagan. On arrival there he built a pagoda on the sand-bank of the Irrawaddy river near Pagan and enshrined the frontal bone of the Buddha, there. When the third terrace of this pagoda was constructed, he brought a replica of the Buddha’s tooth from Sri Lanka and enshrined it also in this pagoda. Before the construction of this pagoda was completed King Anawratha died. WhenÂ KyanzitthaÂ became King of Pagan in succession to Anawratha, he continued to build this pagoda as advised by the Venerable Arahan. This pagoda was known asÂ Shwezigon (Golden Sandbank) pagodaÂ because it stands upon a strip of sand bank. King Anawratha started its construction in 393 Burmese Era. (1033 C.E.) and Kyanzittha continued to build it and hoisted a goldenÂ hti(crown) on it in 452 Burmese Era. (1192 C.E.). Once upon a time, eight Arahants came to the palace ofÂ King KyanzitthaÂ ( also known as Hti-hlaing-shin ) at Pagan and stood for alms. The King took the bowls and offered them meals. He then asked them “Where have you come from, Reverend Sirs?” The Arahants replied. “We have come fromÂ Gandamadana Mountain”. The King was very pleased and had great faith in them, and built for them a monastery for their residence during the rainy season. He also invited them to come to the palace every morning and have their meals there during the full three months of the rainy season, and fed them regularly. One day, the King asked the Arahants to make a cave, by using their superhuman power, in the likeness of theÂ Nandamula CaveÂ which stands at Gandamadana Mountain in the Himalayas. The Arahants complied with his request and fashioned a cave exactly like the one there. The King built a huge cave-temple in Pagan resembling in appearance the Nandamula Cave, and called it Nanda. It is now known asÂ Ananda Pagoda, built in 452 Burmese Era. (1192 C.E.). It is famous all over the world as the best specimen of Myanmar (Burmese) architecture. Centuries agoÂ TapussaÂ andÂ Bhallika, two merchants fromÂ Ukkala brought the sacred hairs given to them by the Buddha from (the Middle Districts of) India and enshrined them at the foot of a wood-oil tree on Singuttara HillÂ where the sacred relics of the former three Buddhas had already been enshrined. This pagoda is called “The Shrine of the Sacred Relics of Four Buddhas”, because it contains, enshrined within it, the sacred relics of the three Buddhas (namely,Â Kakusandha, KonagamanaÂ andÂ Kassapa) as well as those ofÂ Gotama Buddha. It also takes the name “Shwedagon Pagoda” after the name of the town, Tigumba or Dagon (i.e.,Â YangonÂ orÂ Rangoon). Successive Mon Kings and Myanmar Kings vied with one another in maintaining and improving the Shwedagon which has thus been brought to its present condition and appearance.Â Shinsawbu, Queen Regent of Hanthawaddy gave up her throne when she grew old and set up a cantonment and palace on a pleasant piece of land to the north-west of the pagoda and resided there in constant veneration of the shrine. She died at the age of 76 in 831 Burmese Era. (1470 C.E.) bowing in reverence to the pagoda. The locality where the Queen lived in her old age is known to this day as Shinsawbu Hill. In olden days the monks of Burma, both in Burma proper and in Mon territory belonged to different sects and held different views. 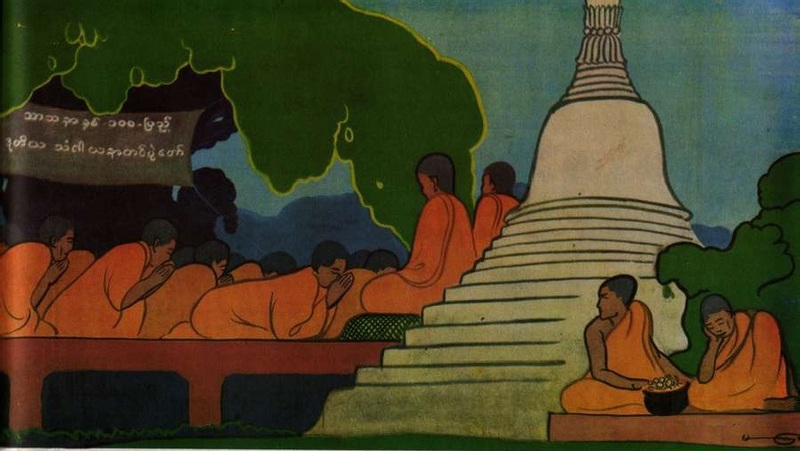 The practice of Buddhism could not therefore be preserved in its pristine purity.Â Dhammaceti, King of Hanthawaddy sent a religious mission consisting of forty four monks to Sri Lanka in 837 Burmese Era. (1476 C.E.) with a view to purifying the religious system in Myanmar. The monks on arrival in Sri Lanka had to be re-ordained in the Sima (place for ordination) in theÂ Kalyani river. On return of these monks to Myanmar, the King had a new Ordination Hall consecrated in Pegu with their assistance and revived Buddhism on proper lines. This new Ordination was named ‘Kalyani Ordination Hall’ after the name of the Kalyani river in Sri Lanka. The Religious Chronicle and the historical account of this Ordination Hall have been inscribed on stone slabs which have been preserved to this day. Â King Mindon, who founded the city and the palace of Mandalay, was a great supporter of the Buddhist religion. He used to confer titles upon, and offer the four necessities of monks to venerable monks distinguished for their learning in the Scriptures. He built huge monasteries in the eastern part of the city and donated them for occupation by large numbers of monks. He was not satisfied with such measures taken by him in support of the religion. 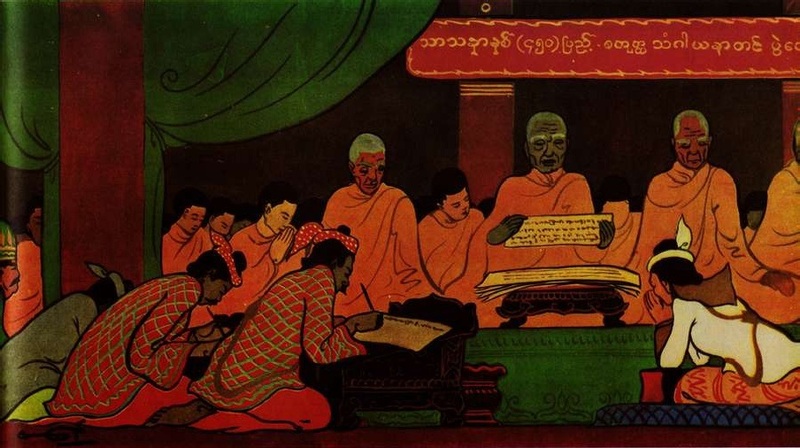 He, therefore, had the Scriptures of the Buddha inscribed on stone slabs under the direct supervision of Maha Theras who were the most learned of the lot of ecclesiastical dignitaries on whom titles had been conferred for proficiency in the Scriptures. With reference to this act of having the Scriptures inscribed on stone slabs, King Mindon is known today as the “Royal Convener of the Fifth Buddhist Council”. In the days of the Myanmar Kings, the rulers were just administrators and most of the ministers also dispensed justice well. Officers under their control were also prevented from doing any injustice or wrong. The people were law abiding and until not very long ago rains were regular, and even in dry zones agricultural land could be cultivated with success. Textiles, consumer goods and fancy goods were not imported into this country from foreign places in these days as at present. Consequently there was no drainage of the country’s resources to foreign lands. Paddy, rice and oil were produced in profusion and there was more than enough for local consumption. Scarcity of thefts and robberies kept the people happy and contented. They celebrated pagoda festivals and other charitable functions, and used to go round with an artificial tree laden with native cakes, sweet meats and fruits, such as plantains and coconuts, in a carefree and joyous mood of charitable display.